Tout commence avec une photo d’ Alfred que me montre Davide, la face Est du Grand Combin! 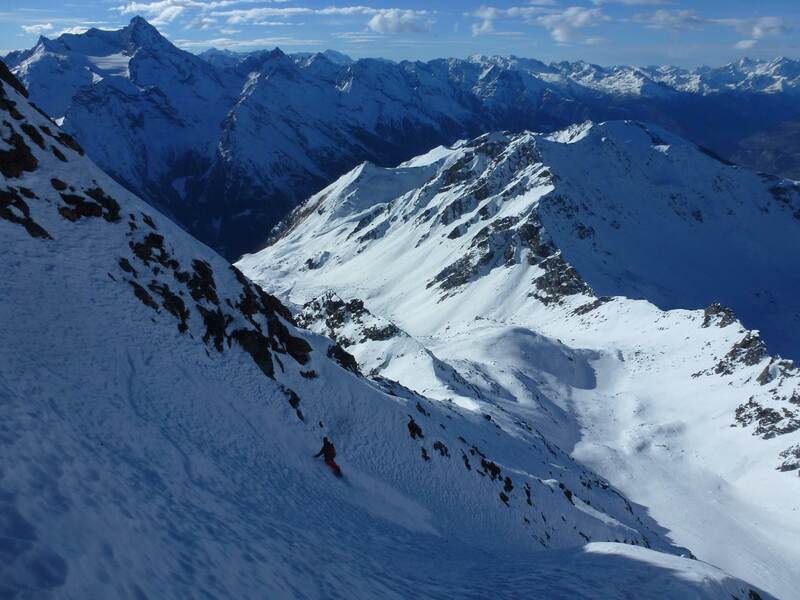 Une belle face vierge de 700m sur un des sommets mythiques des Alpes, l’idée est alléchante. 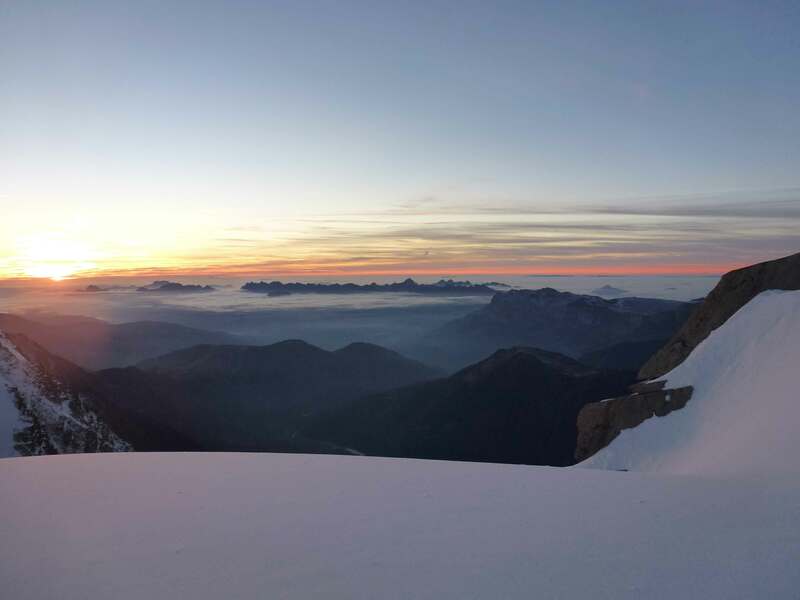 Quelques semaines plus tard la saison tire à sa fin, Davide me propose un repérage de la montagne qui se termine en réveil nocturne et plus de 1500 m de dénivelé positive… pour 5 min de ski. 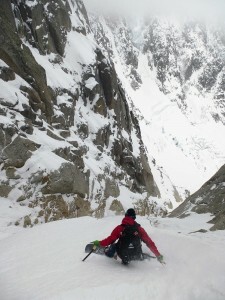 Malgré tout nous avons une meilleures idées sur les possibilités et les impasses. 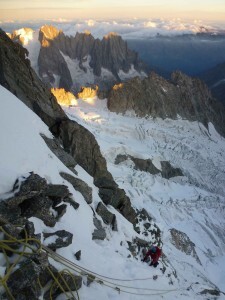 Deux jours plus tard nouveau réveil nocturne, après 5h de marche bien chargés nous laissons des affaires au refuge Amianthe. 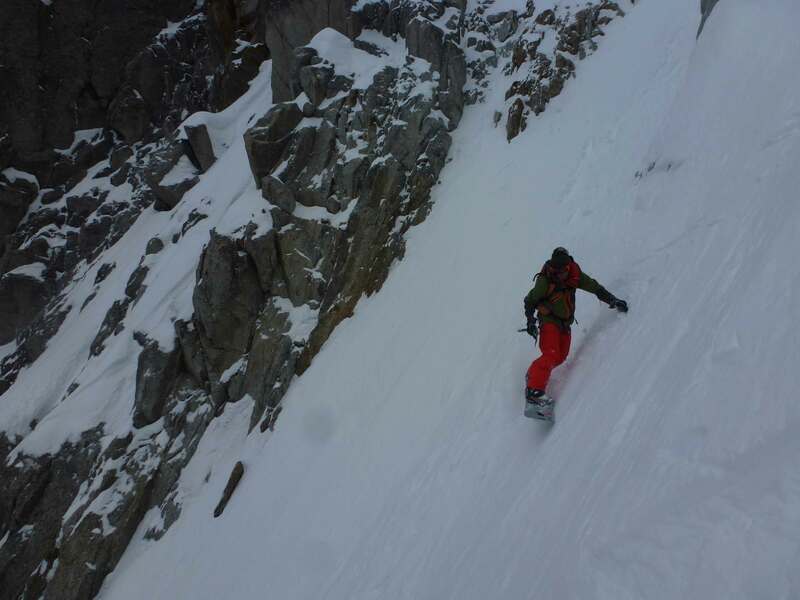 On peut enfin chausser les splitboards direction la voie italienne, les conditions de montée sont agréables et la neige chauffe peu. 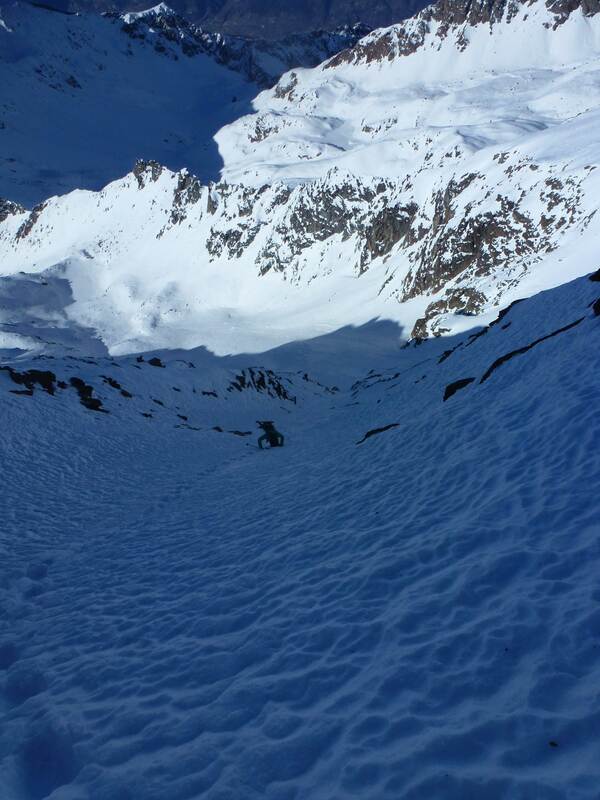 Nous nous arretons sur une belle épaule à 4200m, au pied d’ un ressaut rocheux qui barre l’ accès au sommet principal. 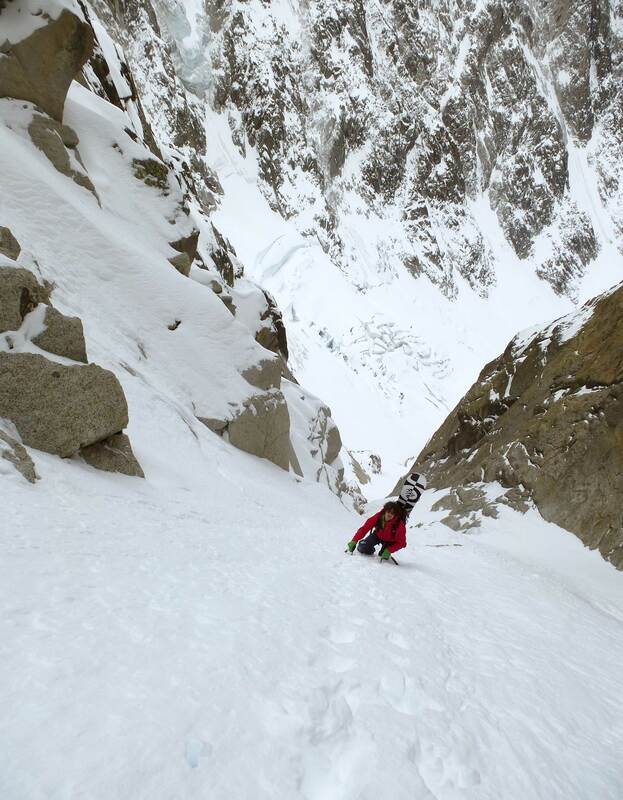 La descente s’ effectue sans encombre dans des pentes soutenues mais pas extremes. 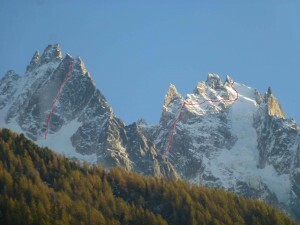 Arrivés en bas de la pente il est encore relativement tot et nous sommes en forme, nous reprenons donc notre trace de montée sur ces 600 mètres d’ascension et plongeons dans la face Sud Ouest. La pente est un peu raide à l’entrée puis la grande rampe est plutot couchée avec une neige très facile à rider. 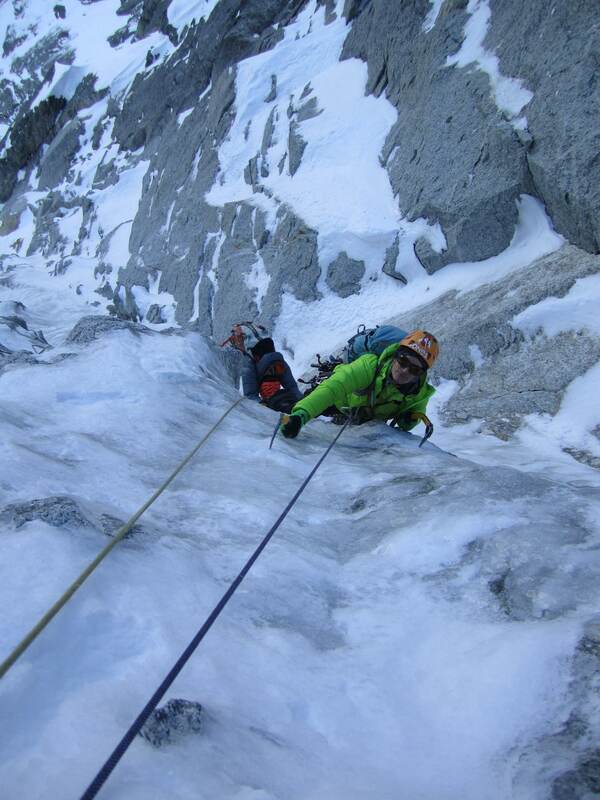 Nous sommes rapidement sur le glacier au pied de la face et rentrons nous reposer au refuge. 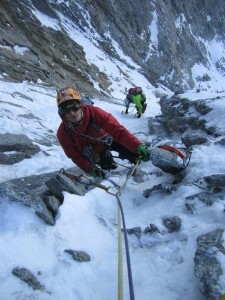 Denis Trento nous rejoins dans la soirée pour nous accompagner le lendemain sur notre objectif principal, la face Est. Réveil à minuit et ascension nocturne jusqu ‘à l’ épaule. 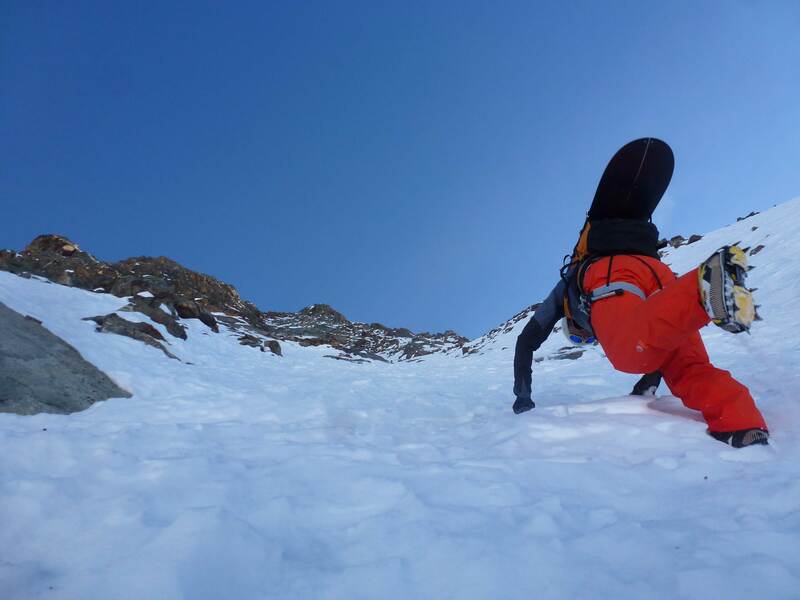 De la une traversée en snowboard amène au pied de la rampe sommitale. 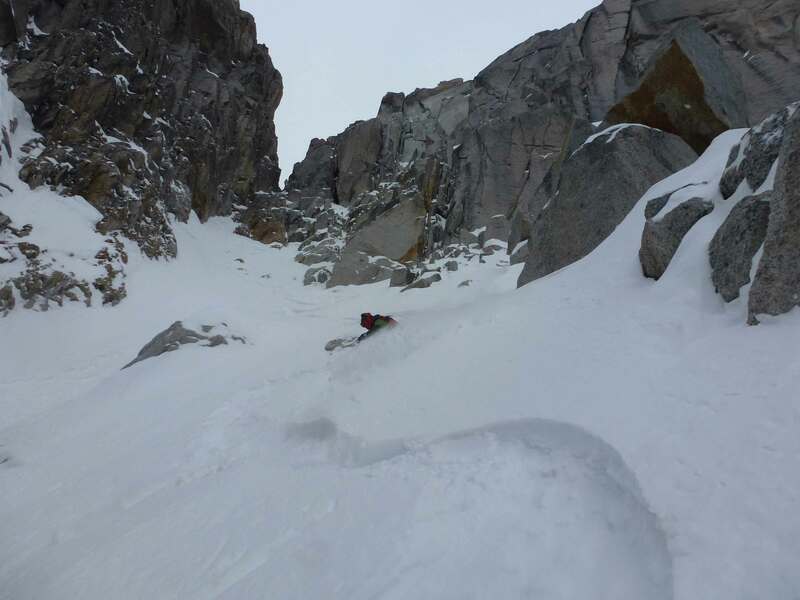 Malheureusement il manque de la neige et un long rappel semble obligatoire pour la descente, nous décidons donc de garder la descente du sommet pour une prochaine fois. 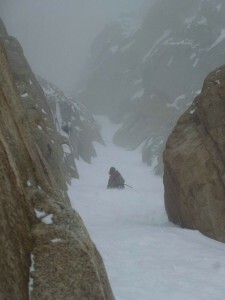 Nous retournons donc à l’ épaule et attendons une longue heure que le soleil ramollisse la neige. 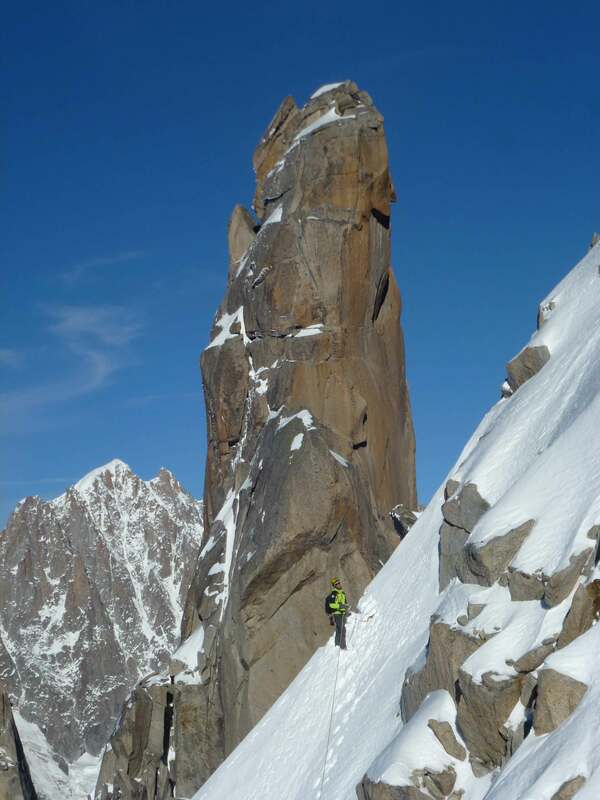 A 8h c’ est parti pour 600m de pente soutenue en neige à peine décaillée, chaque virage est minutieusement effectué. 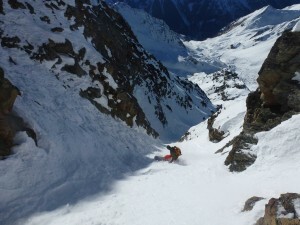 Nous choisissons de remonter à la Tour de Boussine pour limiter l’ exposition de retours plus directes. 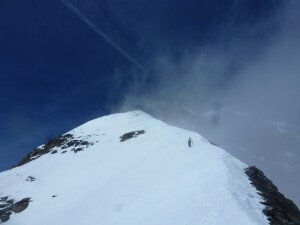 Après une heure d’ effort nous dévalons les 500m de la face Sud Est dans une belle neige de printemps avant un long retour au refuge puis dans la vallée. 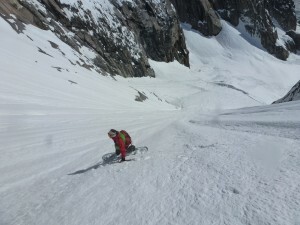 Presque 5000m de dénivelé en 2 jours et 3 belles premières descentes, une belle manière de terminer la saison. Merci à Michelle pour avoir monter du matériel et nourriture au refuge… Merci à Davide et Denis, mais aussi à tous mes sponsors qui m’ ont soutenus cette saison encore: Jones snowboards, O’ neill, Karakoram bindings et Julbo! 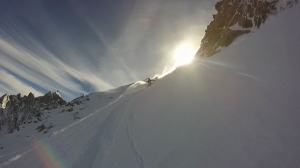 As so often happens, it all began with a photo. Year ago my friend Diego Fiorito (a highly experienced skier and mountaineer with numerous first descents to his name) showed me a photo of the East Face of Grand Combin de Grafenière (4314m.) and I immediately realised that it wouldn’t be simple. 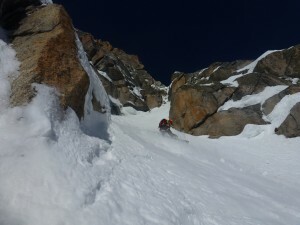 Accessing the face is difficult due to the tormented Glacier du Croissant that guards the flank, the approach is long and since checking conditions is difficult, the whole thing seemed like a rather daunting enterprise. 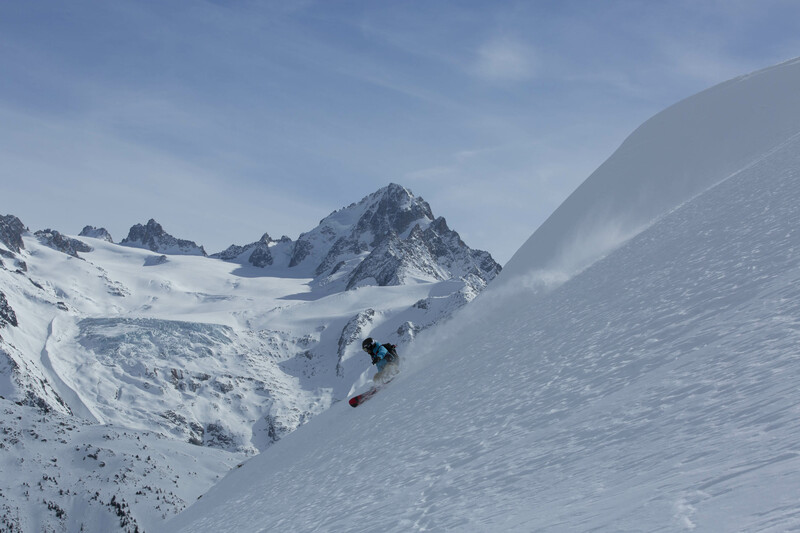 I decided to scrap the idea of ​​skiing this mountain and opted for other goals that were easier to achieve.This year, however, conditions haven’t been too great in the Mont Blanc massif and as a result my friends and I have often been on the lookout for other things to do. 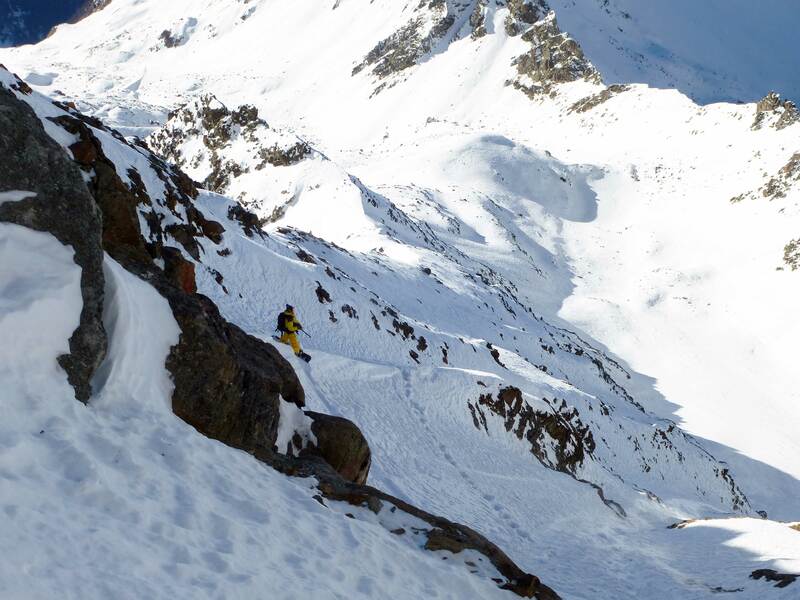 Skiing the East Face of Grand Combin suddenly came back to mind, thanks once again to a photo, taken by another keen skier and friend of mine. 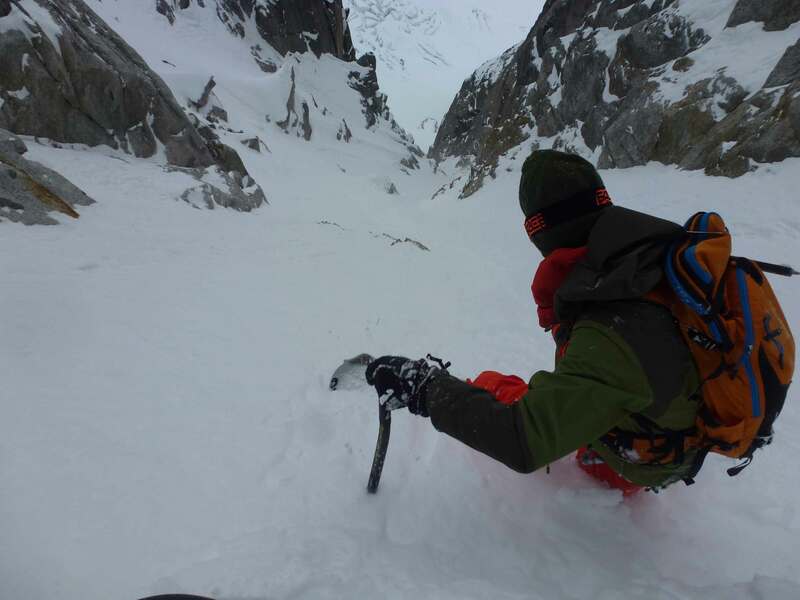 Conditions seemed excellent, all that remained was understand how to reach the face.I showed the photo to Julien « Pica » Herry and he was clearly interested. 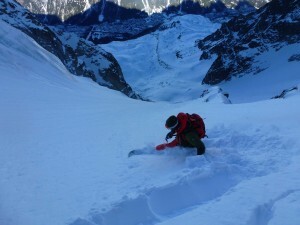 We decided to reccie the Glacier du Mont Durand area at the foot of the Gr. 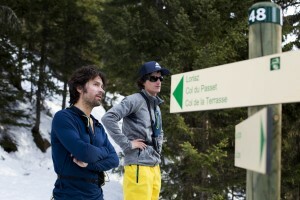 Combin to work out what to do. 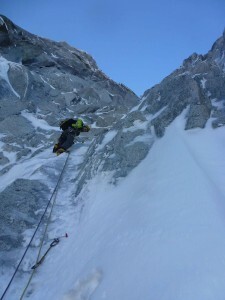 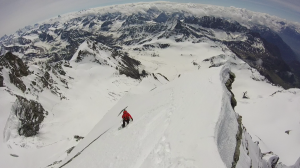 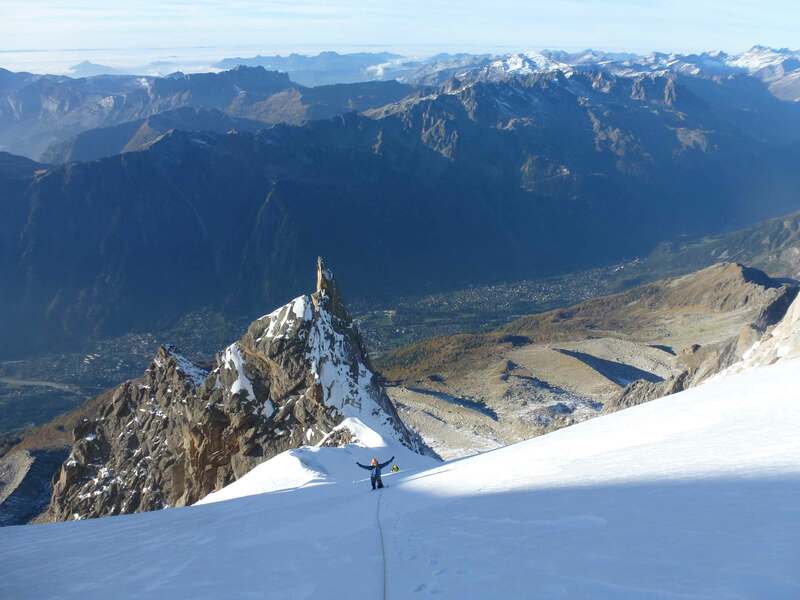 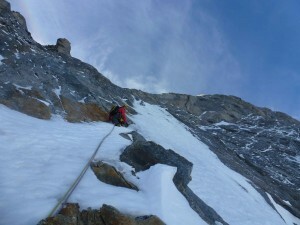 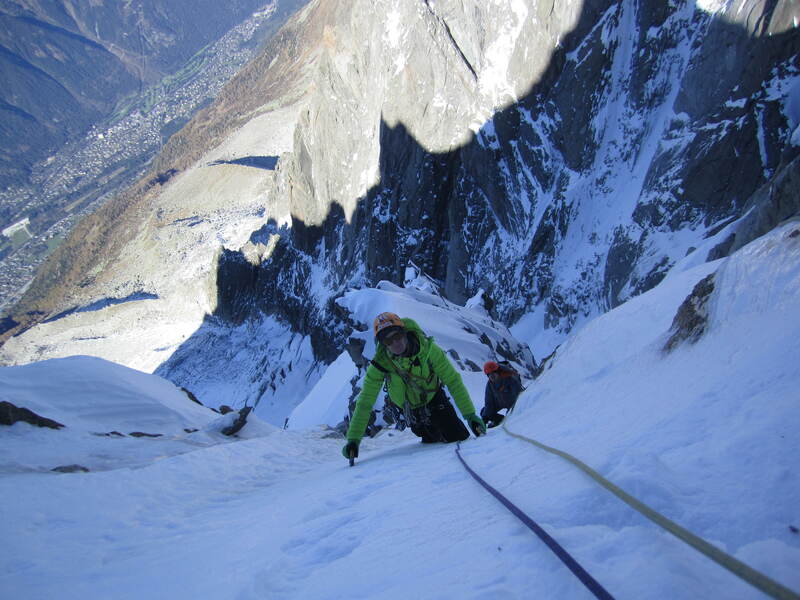 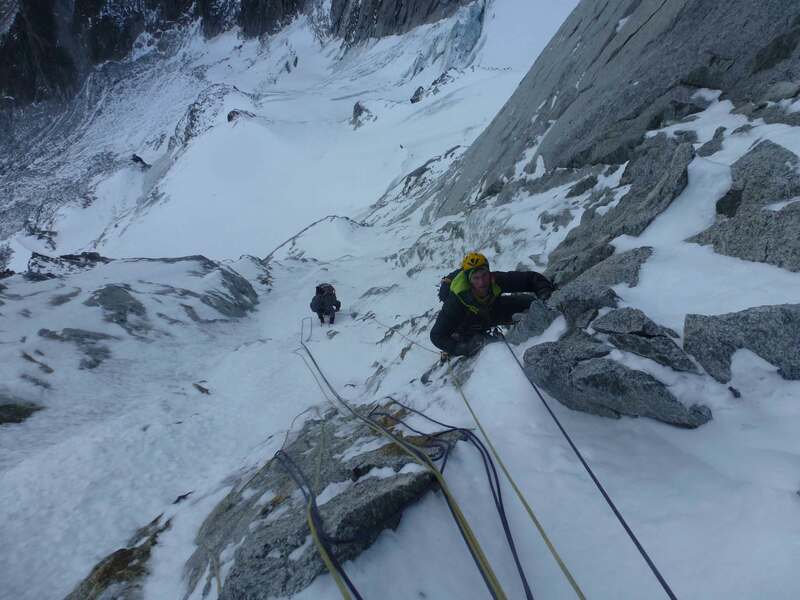 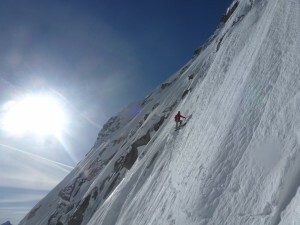 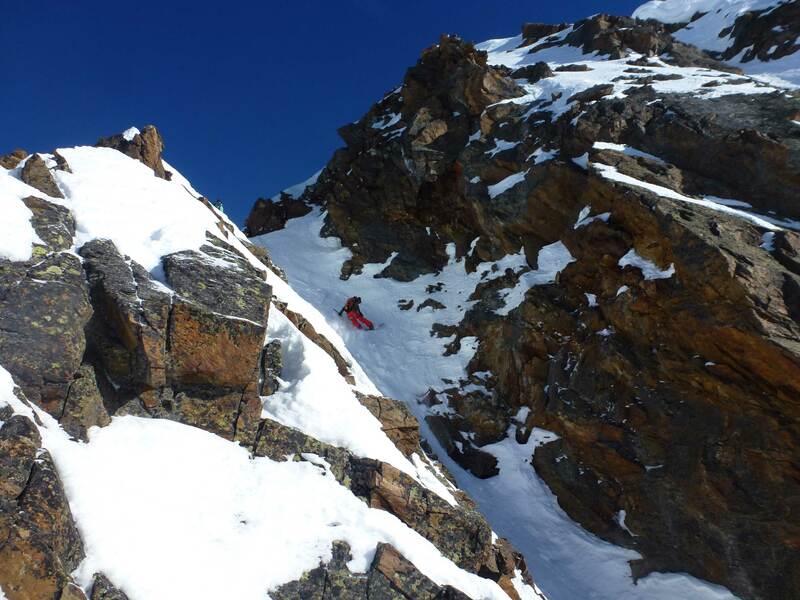 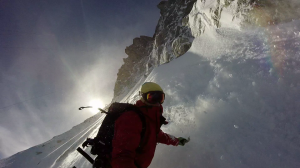 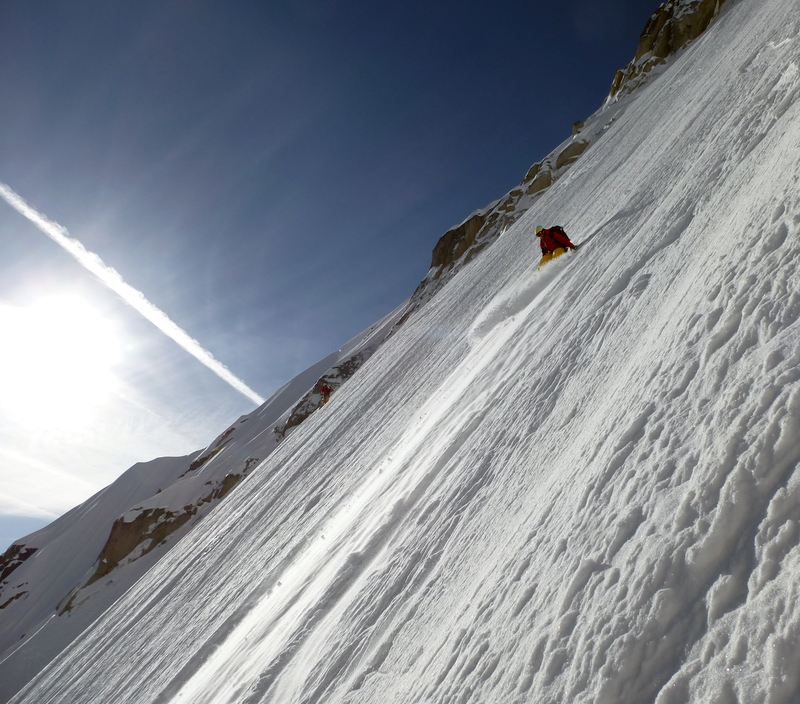 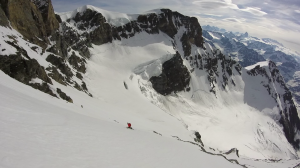 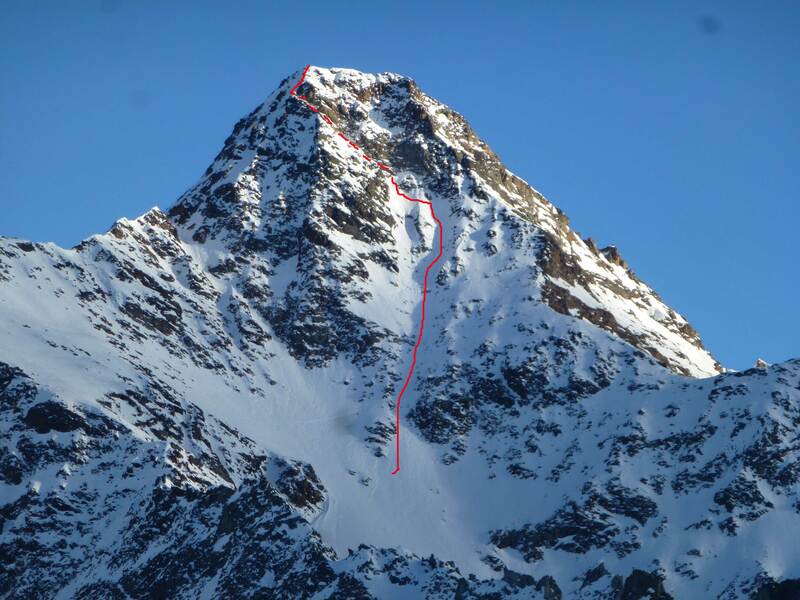 During this exploration, of an area that neither I nor Julien knew before, we realized that the Grand Combin de Grafenière also had two other striking lines: the South East ridge (the Italian route) and the South West Face (skied for the first time, as it happens, on 18 May 2015 by Edmond Joyeusaz). 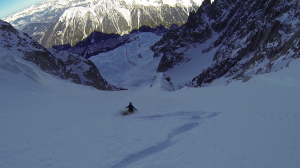 At this point we decided we’d try and ski both lines and hope to also make our other little dream come true, namely to snowboard down the East Face.At 4:30 am on 31 May Julien and I set off from the By valley, above the village of Ollomont, at 2100m above sea level; in 6 hours we reached the shoulder below the summit of Grand Combin de Grafenière, at 4200m. Conditions were great and we rapidly snowboarded down the 600m crest. 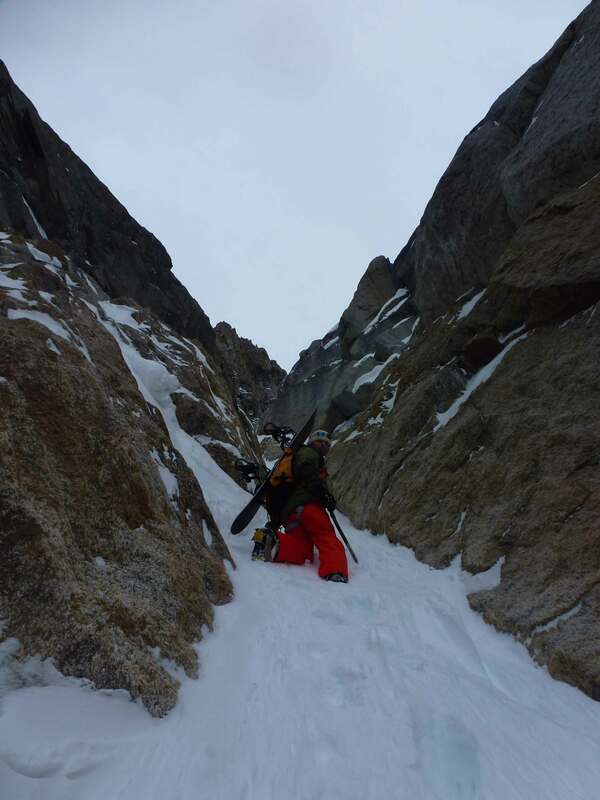 We strapped on our crampons again and followed our trail to reach the shoulder for a second time. Fatigue began to set in but after hesitating for few moments we then launched down the immense SW Face; the spring snow was perfect and in no time at all we skied past the Bergschrund. 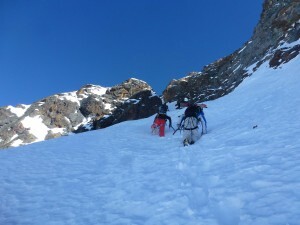 All we had to do now was reach Col Sonadon and then descend to the Amianthe winter refuge. 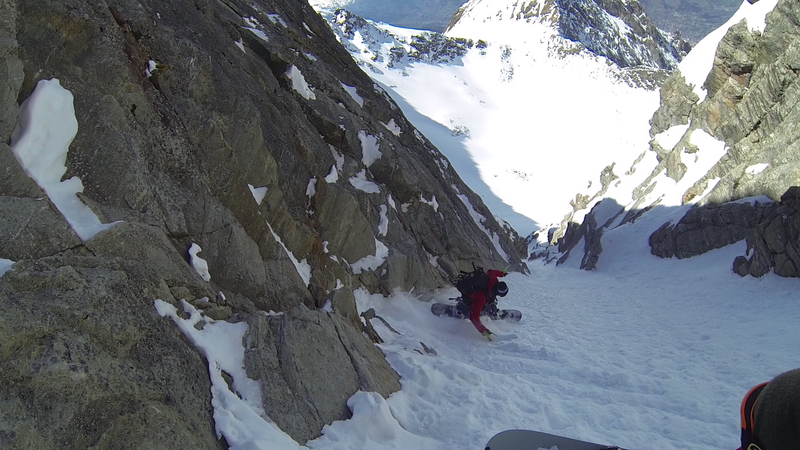 We’d had a long day out in the mountains and our splitboards began to weigh us down. The following day we decided we’d try to reach the East Face via the SE ridge, traversing up high and ascending only the final section of the slope. 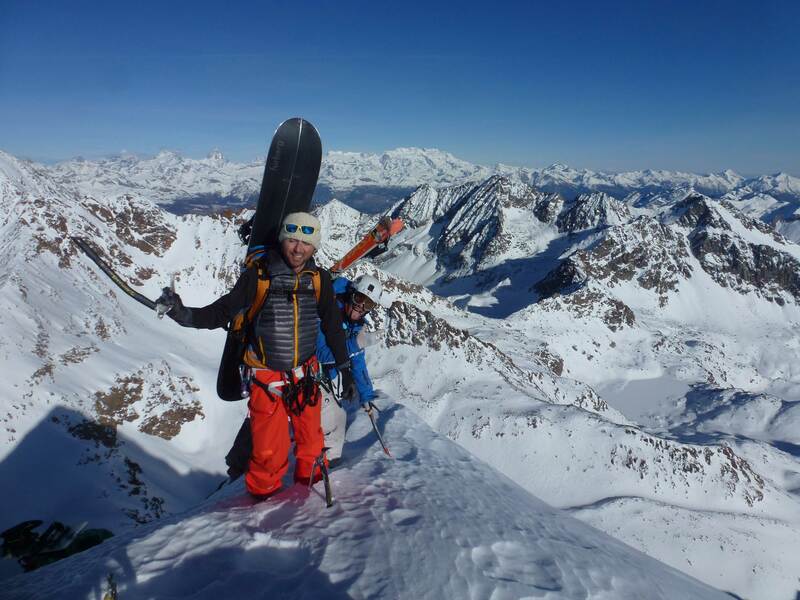 Fortunately we were joined by our friend Denis Trento (a champion ski mountaineer) with whom we’ve shared many beautiful descents this year. 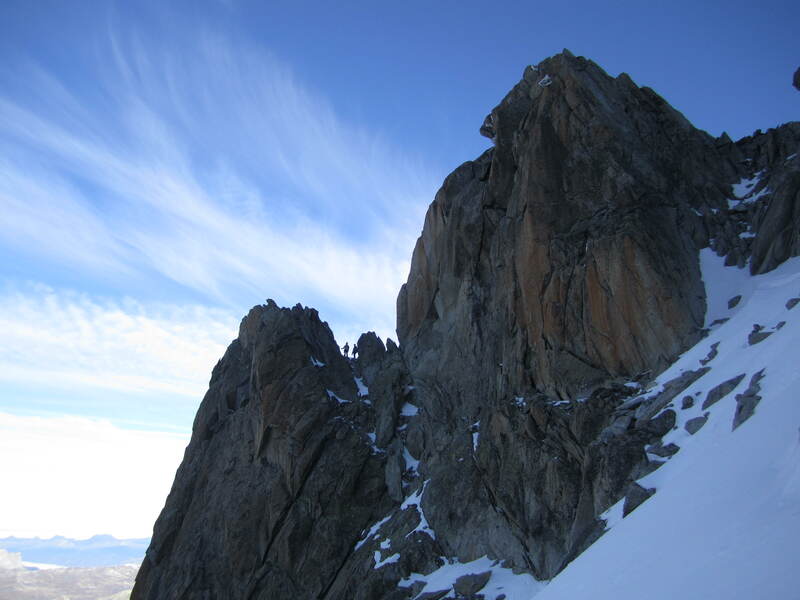 Denis reached us that evening at the Amianthe hut.The night was very short (the second for Julien and myself), the alarm clock rang at midnight and we set off at 01:00 am. 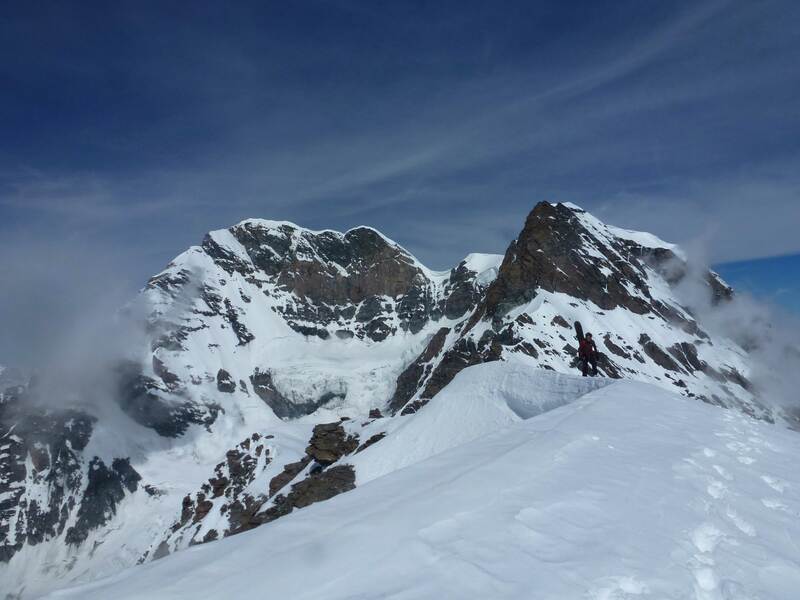 At about 5:00 we reached the summit shoulder of Grand Combin de Grafenière once again; we entered the East Face at the crack of dawn on skis and snowboards, on marble-like snow. 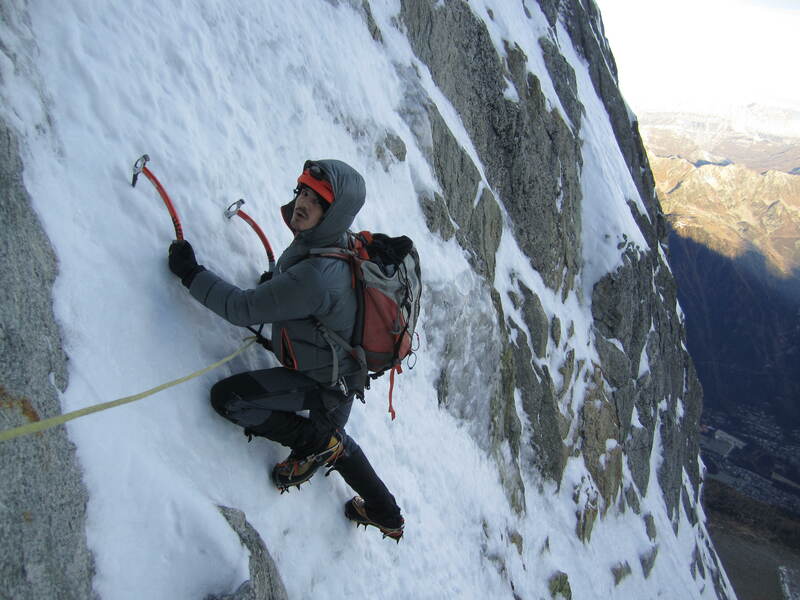 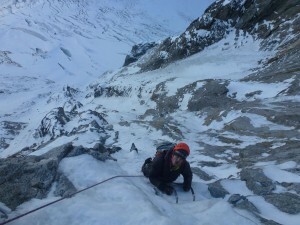 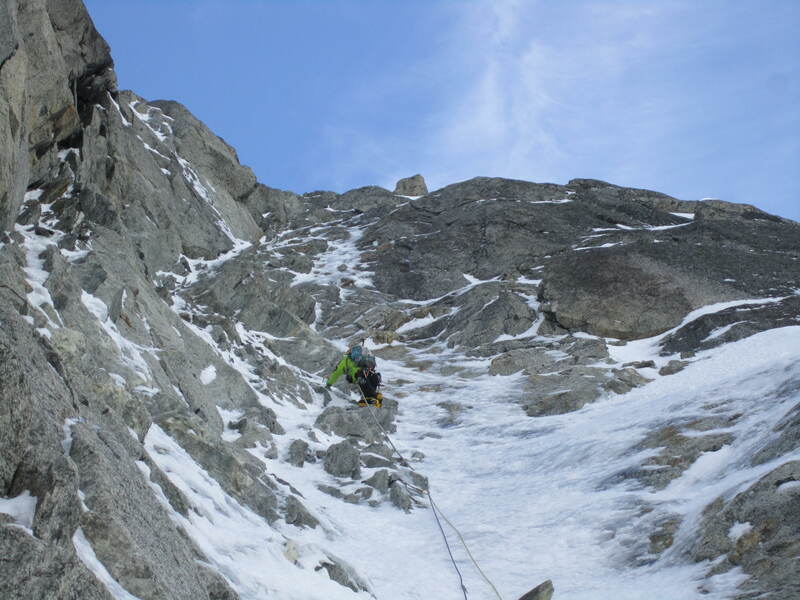 We strapped on our crampons and climbed up the final section of the East Face. 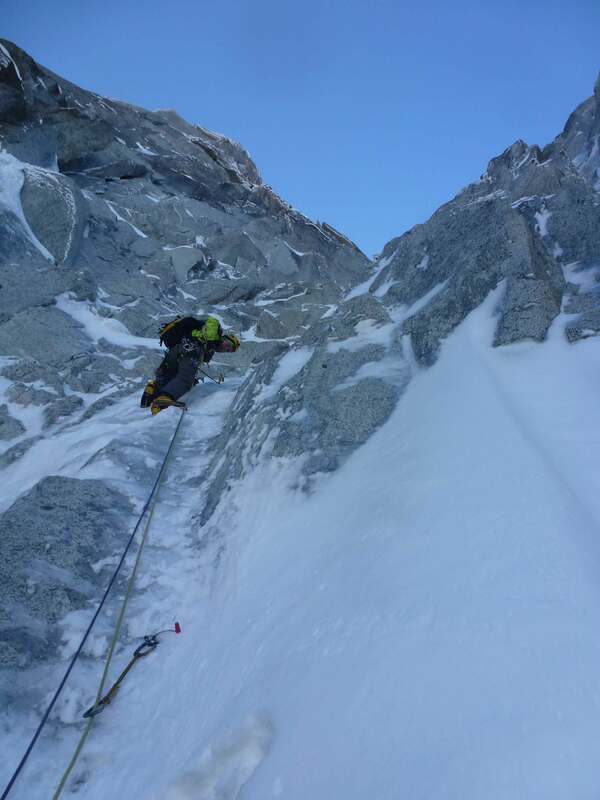 Unfortunately there wasn’t enough snow in the narrowest section and we were forced to make a rappel, as a result we decided that the integral descent from the summit would have to wait for another occasion. 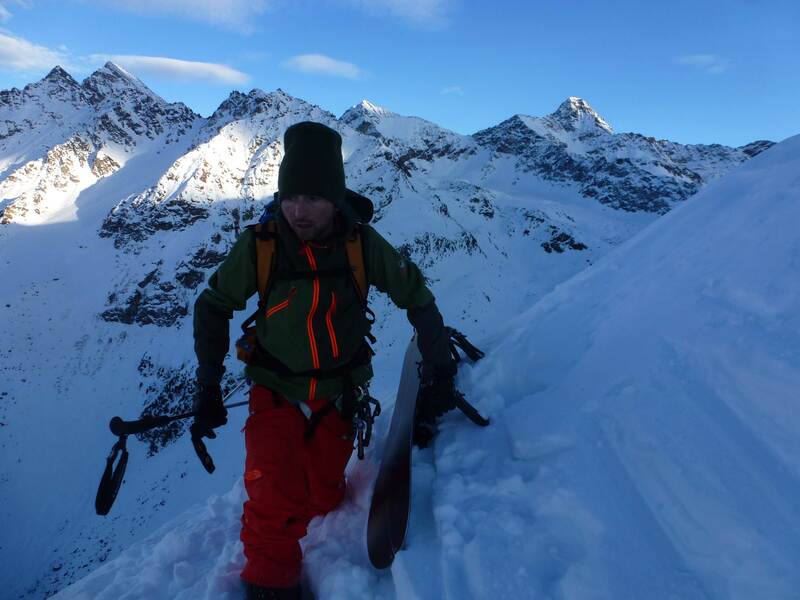 We made do with skiing the Ease Face from the summit shoulder.After having waited for over an hour for the snow to soften we finally stepped into our snowboards and skis and dove into the void. The snow was good and the 600m descent passed by quickly, the slopes were far more sustained than on the two routes the previous day, the drop was ever-present making it much more interesting.On reaching the end of the descent we quickly crossed below and the enormous seracs that dominate Glacier du Croissant and retuned to Tour de Boussine (3826 m.); from this summit we descended towards Glacier du Durand and finally reached the Amianthe hutA special thanks goes to my partner Michèle which lightened the weight of our backpacks on the first day, transporting the rest of the gear and food we needed for the following day. 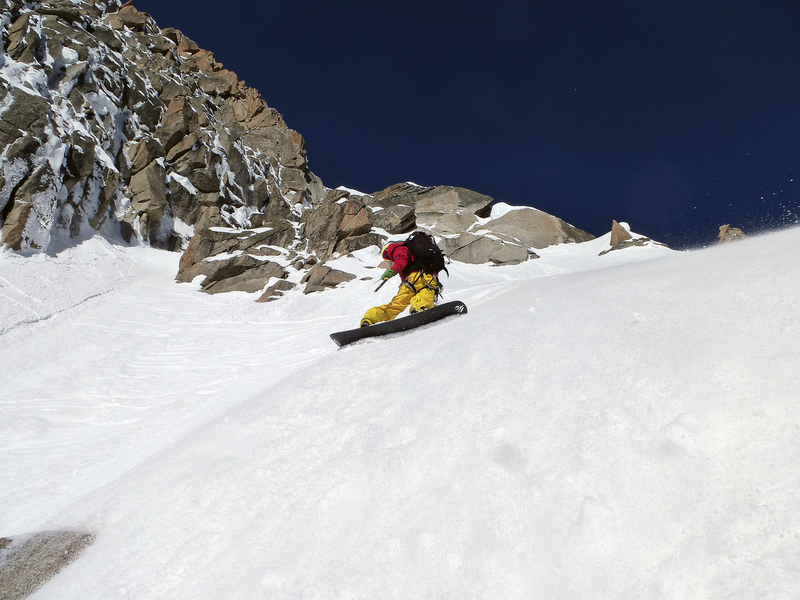 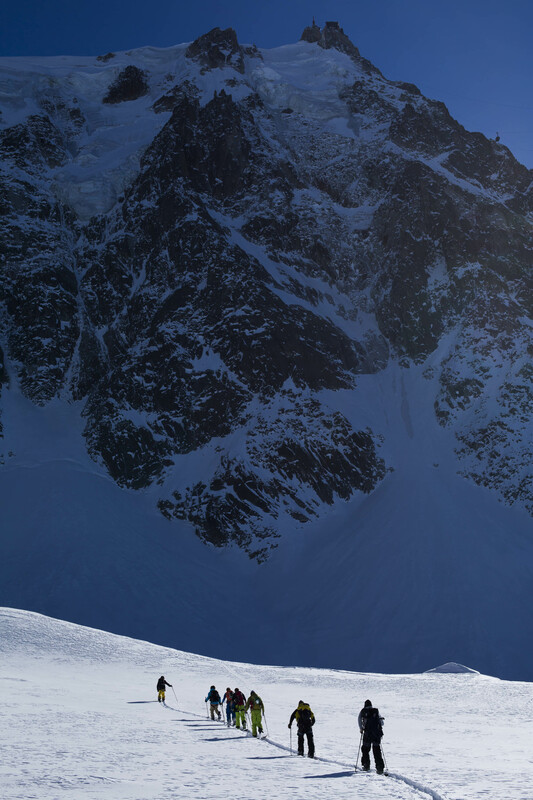 The North Face of Pain de Sucre is a legendary place that has shaped the history of extreme skiing on Mont Blanc. 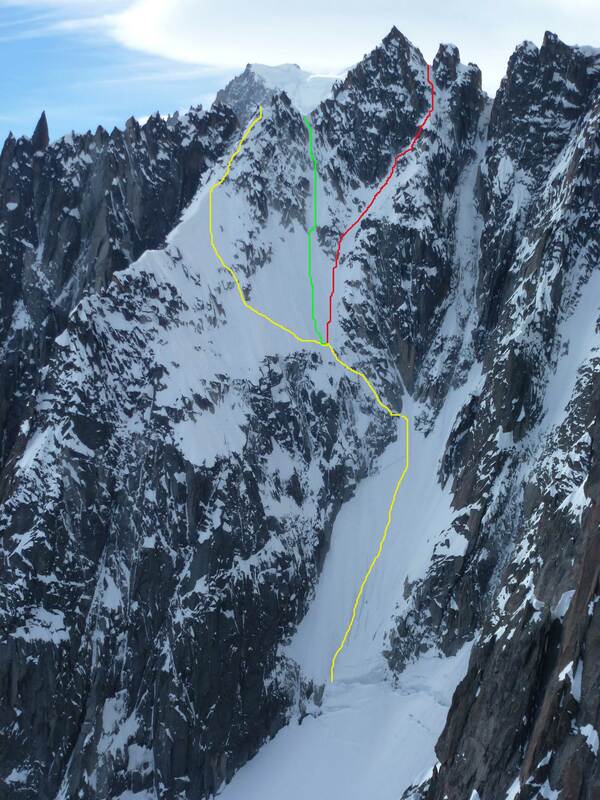 The first ski descent was carried out by Pierre Tardivel on 1 June 1990 with two abseils down the most logical line (marked in yellow). 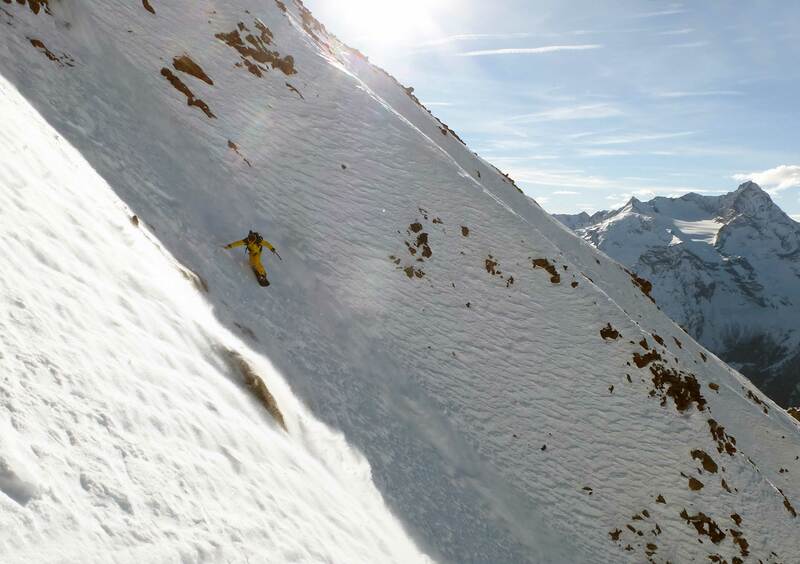 The first repeat happened a mere two days later, at the hands of Dédé Rhem on skis and Jerome Ruby on snowboard. 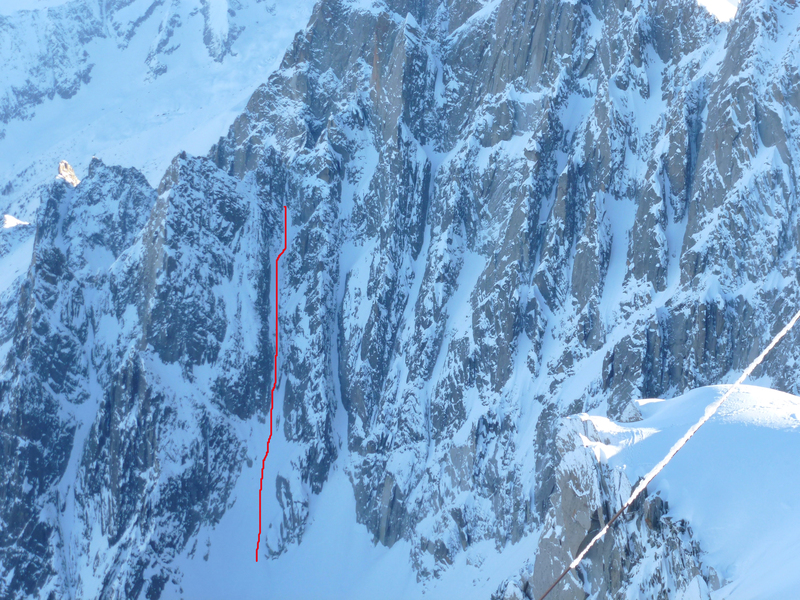 Since then the line has had few repeats, perhaps only a dozen or so.Most of these descents were down the line chosen by Tardivel that could be defined as a variation to the « Voie Original », the route first climbed by Robert Gréloz and Francis Marullaz in 1931 (marked in red). 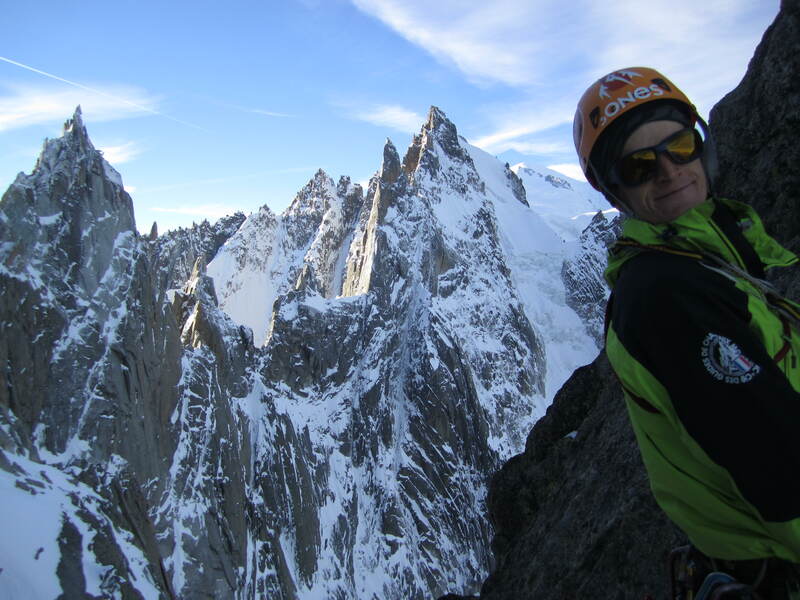 In 2009 Andreas Fransson, Arne Backstrom and Tobias Granath added an upper variation with one abseil to reach « Pain de Rideau” (marked in green). 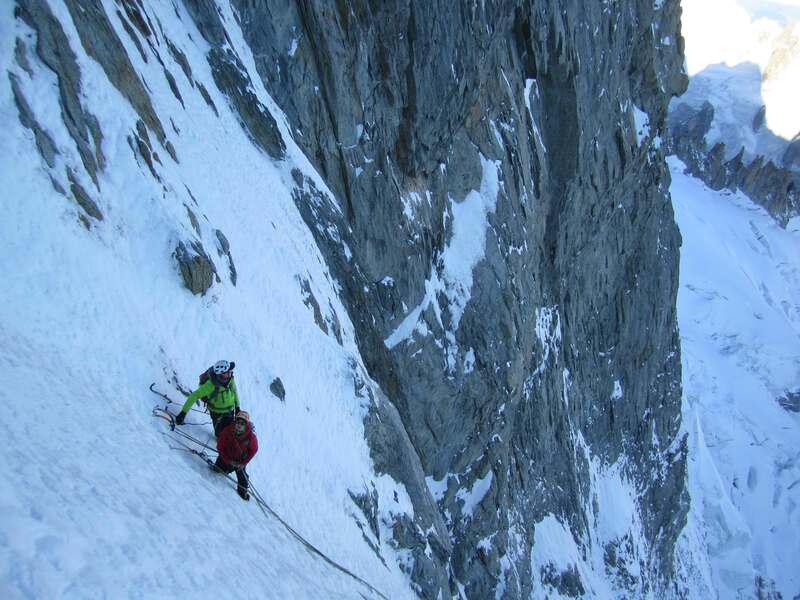 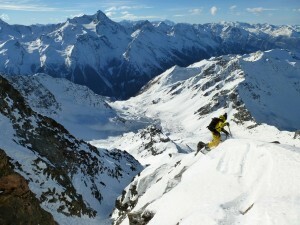 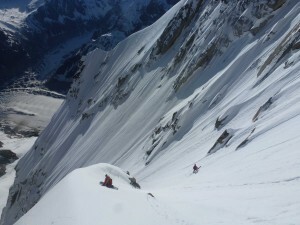 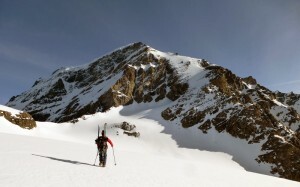 In 2013 Davide Capozzi, Luca Rolli and I skied this beautiful and challenging descent via the « classic » Tardivel line. 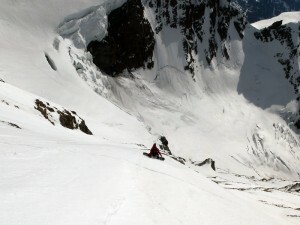 After that our focus shifted to considering whether it would be possible to ski the entire Voie Originale; the idea seemed beautiful because this route leads directly to the summit of Pain de Sucre and, in addition, it had never been skied before.Imagining things is always nice, but when you’rer faced with reality things can be quite different. During the last two years although the face was in condition, the upper section of the Voie Originale was not. 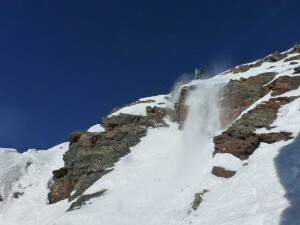 Incredibly, right from the start of this winter snow remained up there and the problem was that poor conditions down the rest of the face made a descent prohibitive. 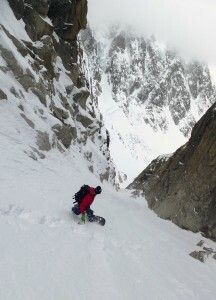 Then May started very wet in the Mont Blanc massif, for days it never stopped raining and the high temperatures helped the snow to stick to the slopes.We’d pushed the idea of Pain de Sucre a little aside, thinking that by now it was too late in the season, but then all of a sudden two young skiers from the Chamonix valley (Lambert Galli and Jules Berger) skied the face and found incredibly good snow conditions. 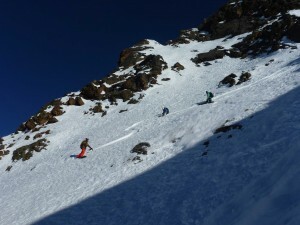 Thanks to the information these two talented skiers gave us Davide and I decided to attempt our Voie Originale descent. 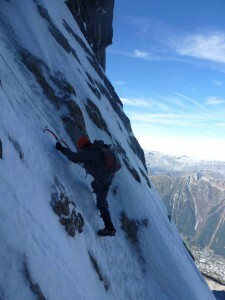 We were joined by our friend Francesco Civra Dano who didn’t think twice about accepting our invitation. 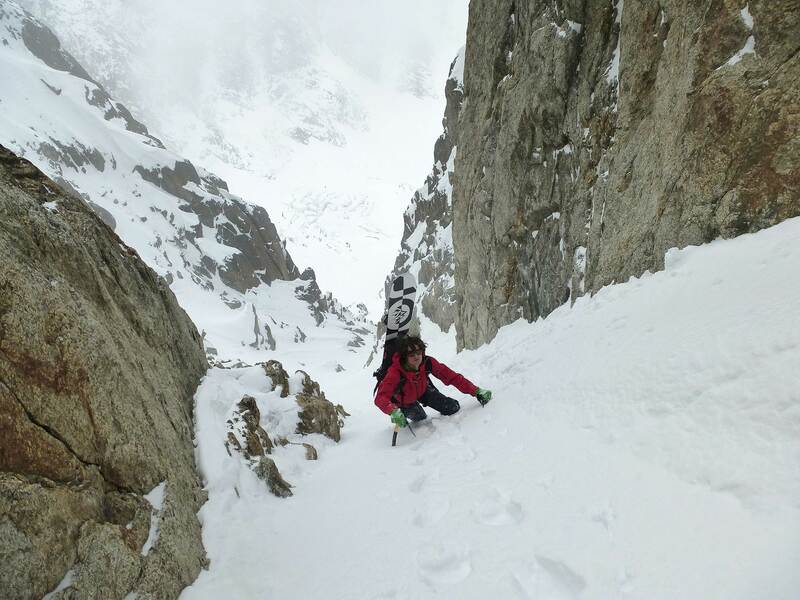 Finalement la neige a collé un peu et malgré un rappel de 50 mètres necessaire pour entrer dans la face, nous décidons de tenter notre chance avec Lambert et la Mule. La neige se révèle etre bonne du haut jusqu’en bas et personne ne nous skie sur la tete, que du bonheur! 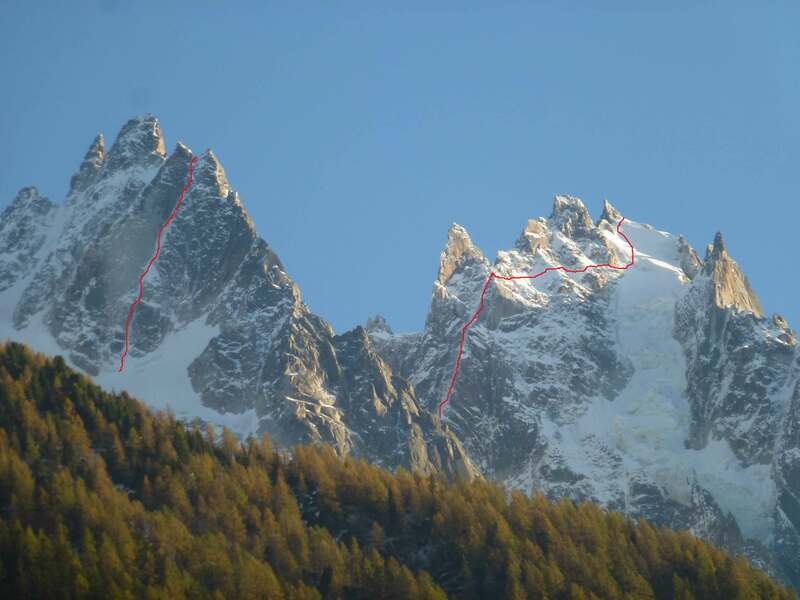 Du coup rebelote le lendemain avec la Mule, le haut a pris un peu le vent mais les 2 tiers inférieurs sont encore meilleurs après l’orage de la nuit… Au final les 5 seules traces de la saison dans la face Nord! 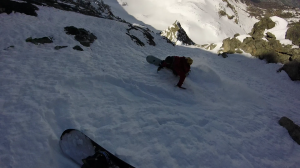 Et enfin le travail en switch paye et je peux m’ amuser sur une planche twin, à passer de regular à switch et vice versa quand je le souhaite… La liberté! 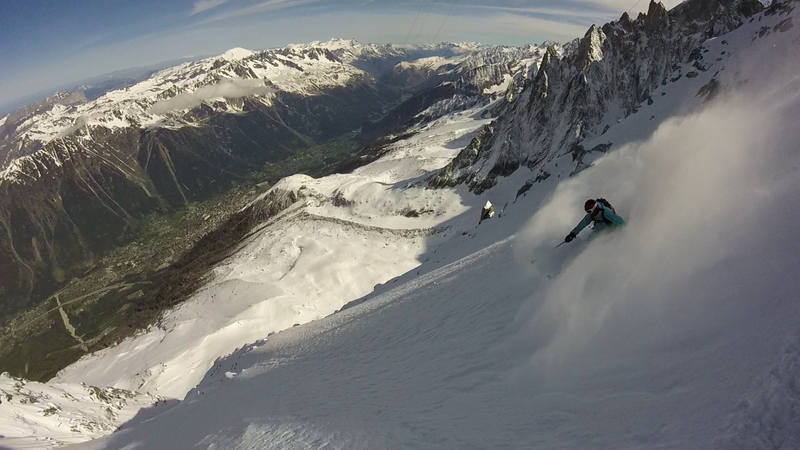 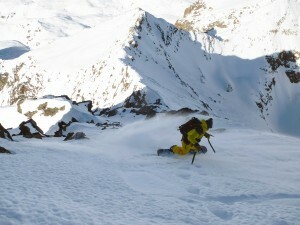 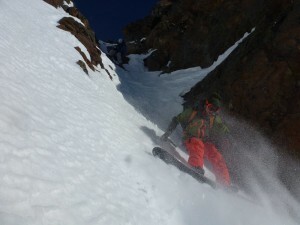 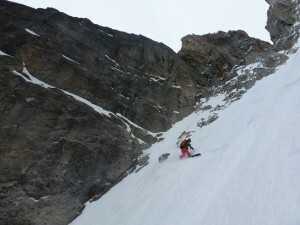 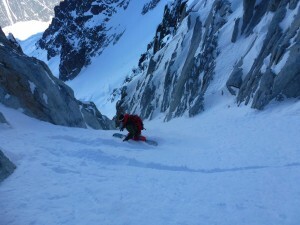 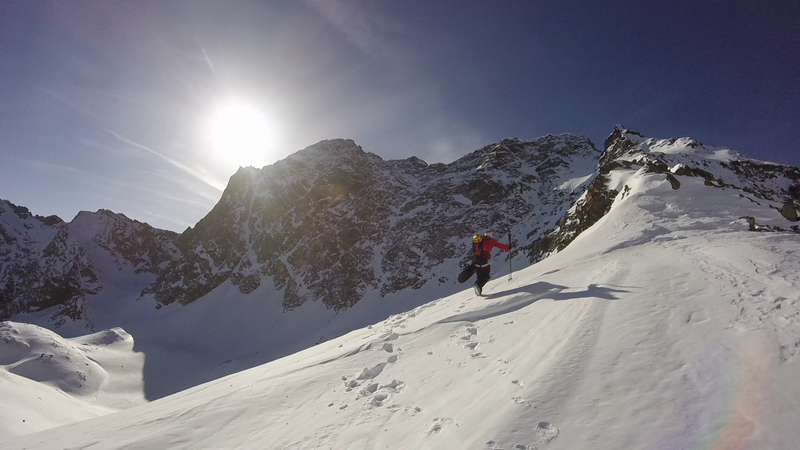 Two great days playing in the North face with Lambert and la Mule, alone in the route and finding great snow! 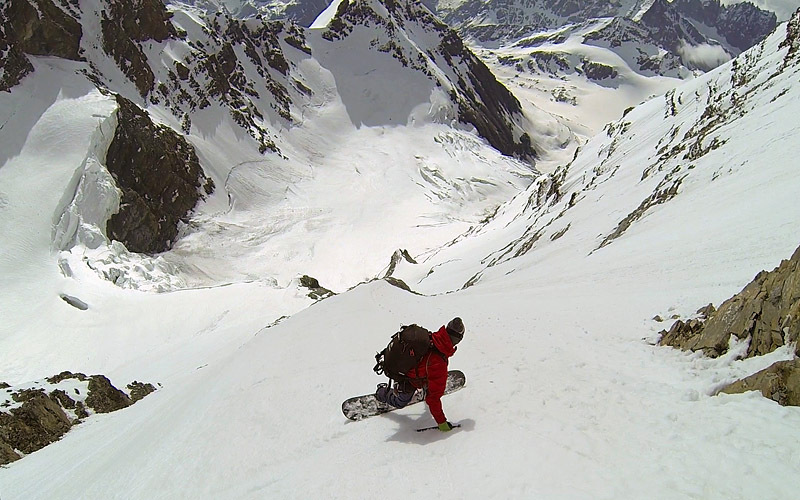 A good fun on my twin board switching from goofy to regular anytime I want! Depuis bientot un an je m’ entraine à monter mes snowboards en Goofy pour progresser en switch en toutes conditions. 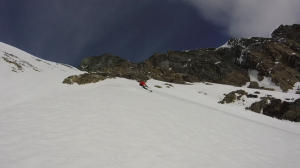 Mon reve de snowboarder depuis quelques années est de pouvoir descendre certaines lignes en goofy, car en snowboard contrairement aux skis, certaines descentes sont plus appréciables en goofy ou regular, notamment certains devers et traversées… Il était temps de tester mes compétences en switch dans une pente raide, je ne suis pas tombé… et me suis meme amusé. 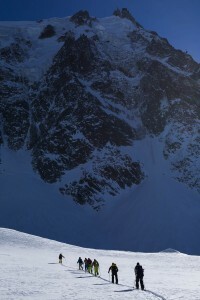 Le déblocage psychologique est amorcé! 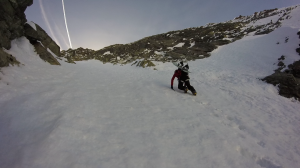 After one year training switch riding in any conditions, changing my settings to a goofy stence, it was time to go one step further: steep terrain! It worked pretty well for a first experience, I need a bit more practice but I already had fun! Bernhard Ritzer from O neill contacted me to organise a 3 day trip in Chamonix. 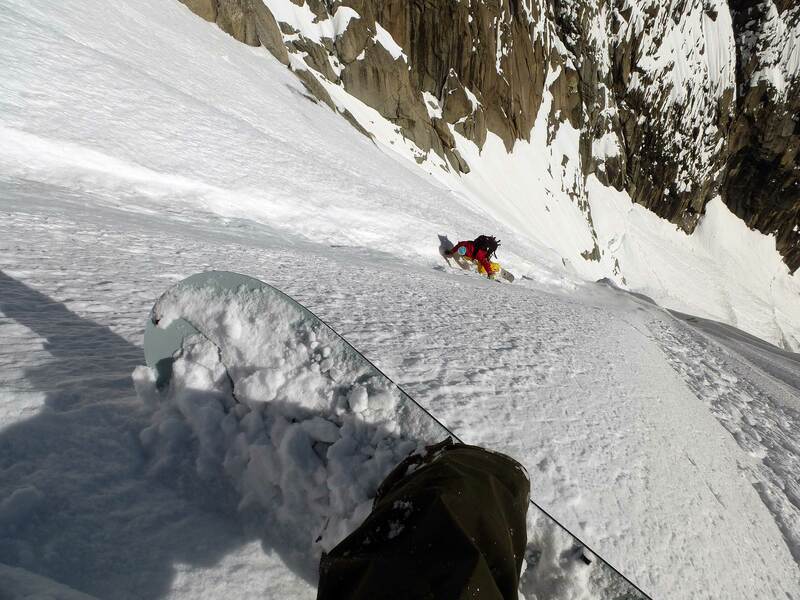 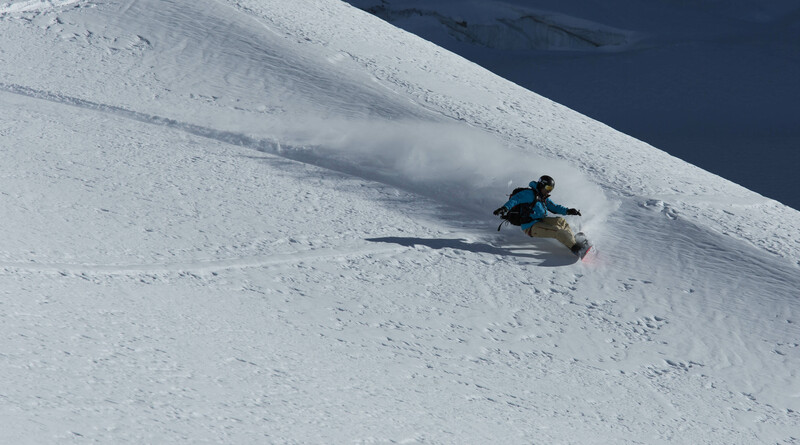 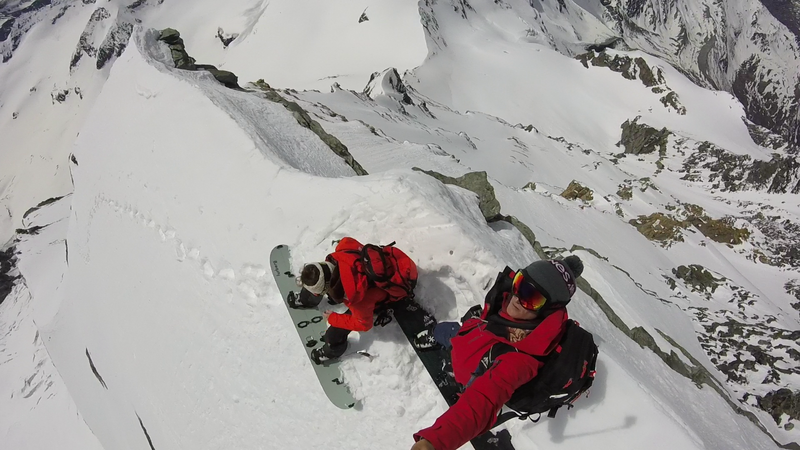 Participating to a photo contest, 4 snowboarders won a splitboard journey with Jeremy Jones. I was lucky to be the guide of this nice group and despite the lack of snow we managed to find a few powdery and quiet slopes… Thanks everyone for this nice experience! Publié le janvier 11, 2015 par admin & classé dans Uncategorized. La pointe Garin, culminant à 3451m, est un des principaux sommets autour du Mont Emilius. Alfredo avait repéré la face Ouest pour une potentielle descente à skis… On se retrouve à Pila ce matin avec Davide, Stefano et Alfredo pour prendre le 1er télésiège. L’ approche est longue et sauvage, avec 2 cols à passer dans une neige souvent ventée et changeante… Les conditions deviennent meilleures dans la face avec une vieille neige froide moins ventée. 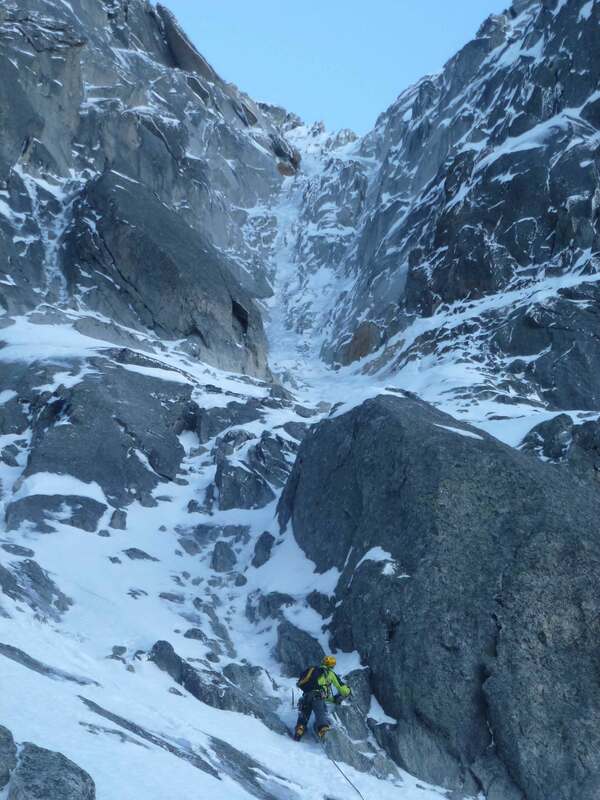 Un beau couloir caché nous permet de rejoindre la pente sommitale, raide mais courte. 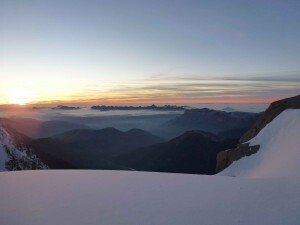 Le sommet est plat et confortable, et la vue magnifique à 360 degrés. 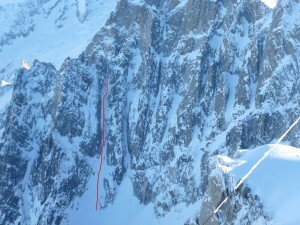 La descente se passe rapidement et sans encombre mais le retour à Pila prendra un certain temps et laissera des traces dans les jambes! 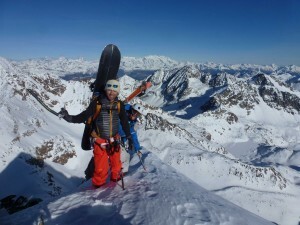 Une belle aventure italienne, un tout petit peu décevante pour la hauteur de la pente (400m) mais qui valait largement la peine pour tout le reste! 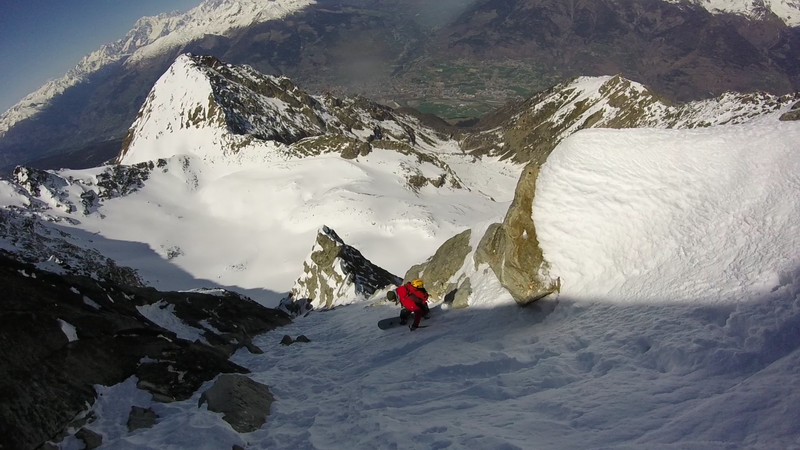 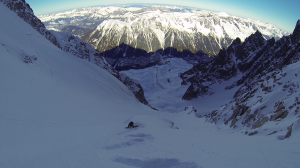 Premiere descente connue en skis et snowboard. 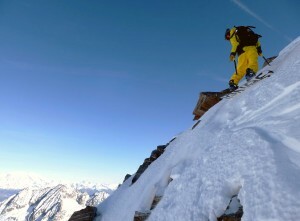 Peak Garin is a 3451m summit located just behind more famous Mont Emilius standing above Aosta city. 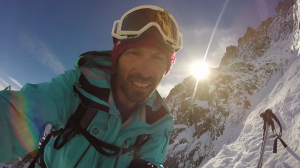 Alfredo found a line to ride on the West face and invited Davide, Stefano and myself to go and have a look. 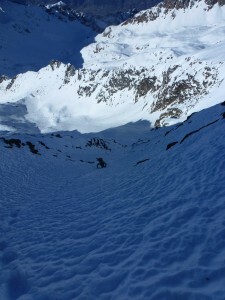 Our long journey started from Pila lift and after 3 hours of touring and traversing over 2 passes we finaly got to the bottom of the face. The snow slowly got better and less wind affected. 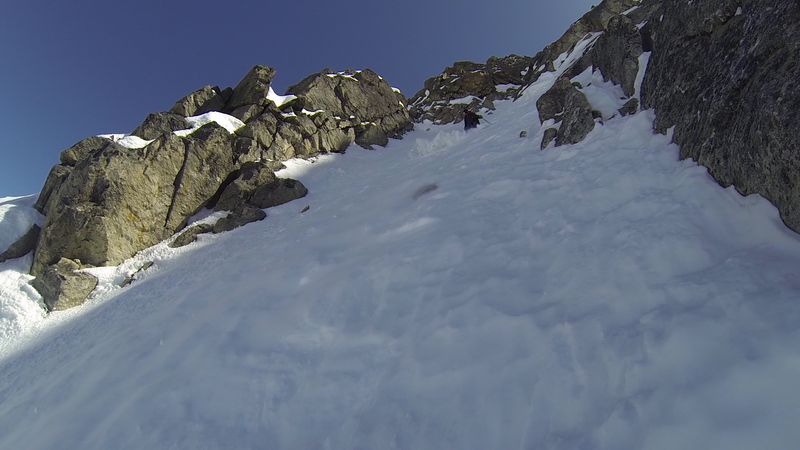 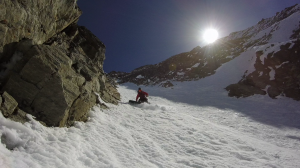 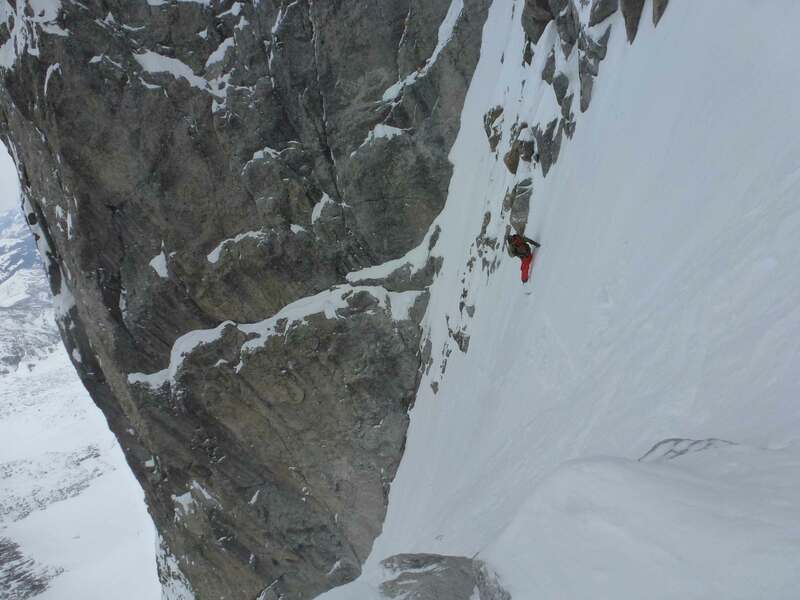 A hidden couloir allowed us to ridge the last slope quiet easely. The view from the summit is splendid, from Matterhorn to Mont Blanc, including all those wild and lower italian summits all around… Riding down the face was a child game compared to the long and tiring way back to the valley. 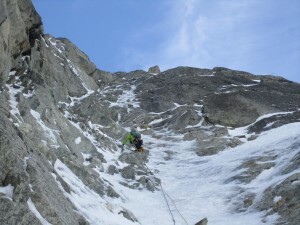 Thanks to my italian friends for sharing the project and guiding me on their mountains! Apparently a first ski and snowboard descent. 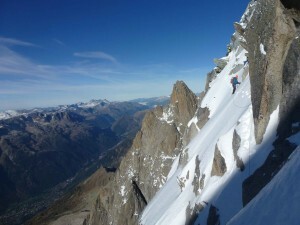 Ce beau couloir de 400m est (très) rarement parcouru malgré son accès pratique et assez rapide, les contre pentes y sont raides et la descente est toujours technique! 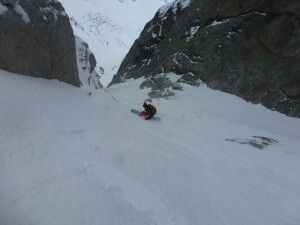 Après 2 descentes en janvier et mai 2012, c'est avec plaisir que nous y sommes retourné une 3ème fois, trouvant une neige plutôt bonne. Une bonne remise en jambes avec mon traditionnel acolyte Davide! 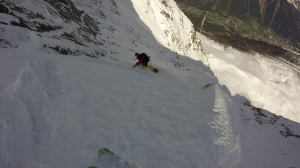 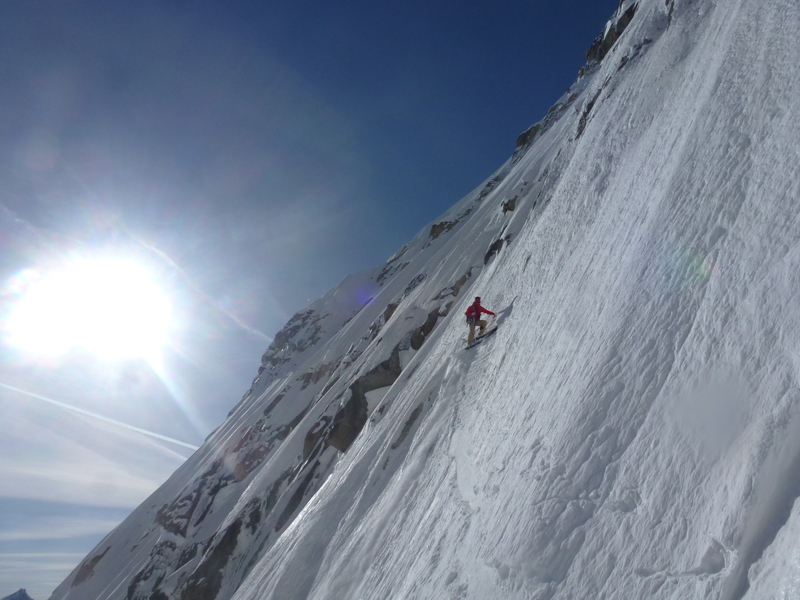 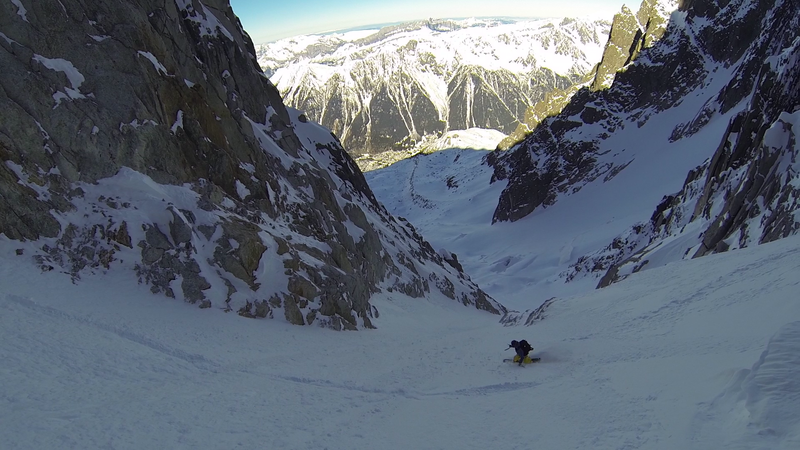 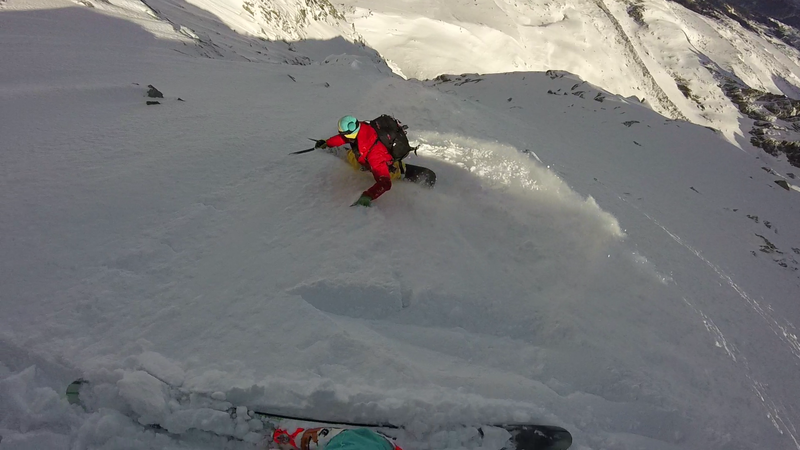 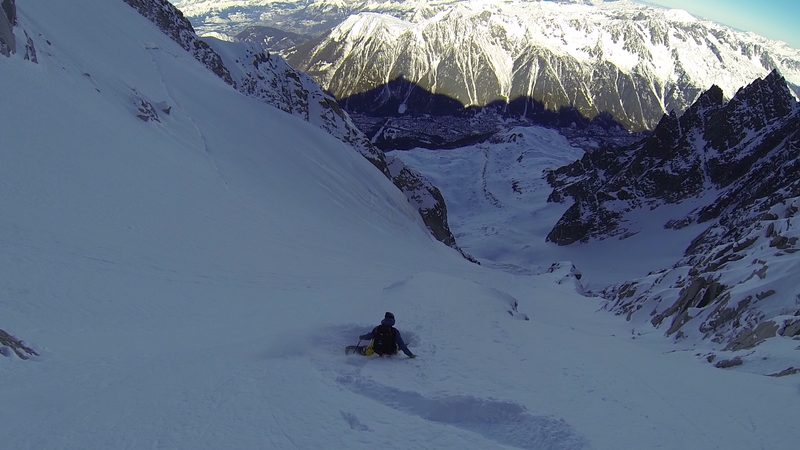 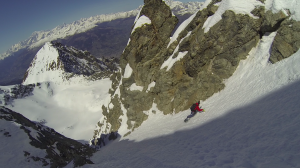 Third time we ride this nice 400m couloir with Davide. 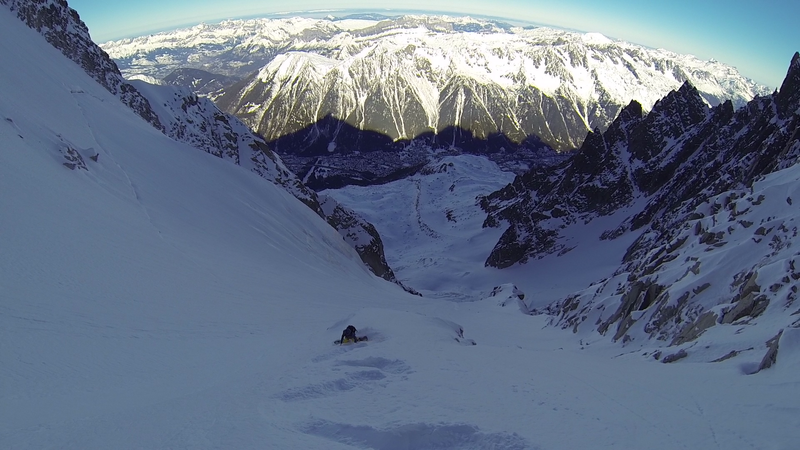 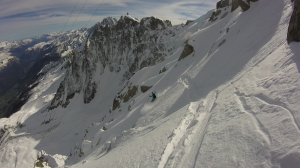 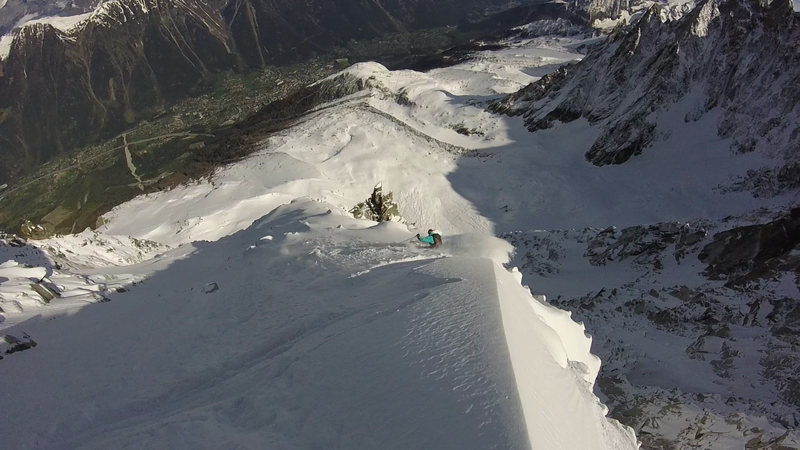 Easy access and visible from the Midi lift, it seems that this couloir never saw any other tracks than ours! 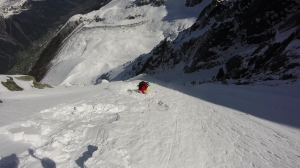 We found once again pretty good snow and technical turns. 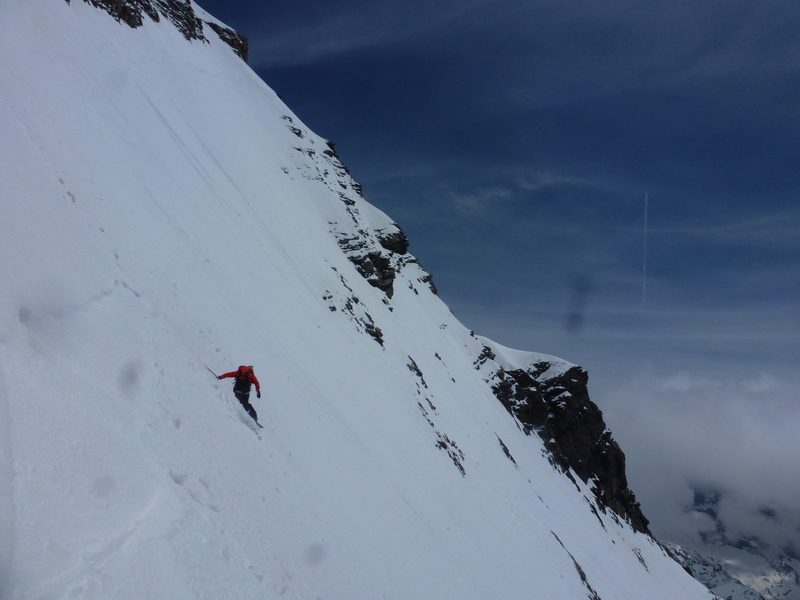 A good surprise to begin the season, looking at the very dry conditions almost all over the Alps. 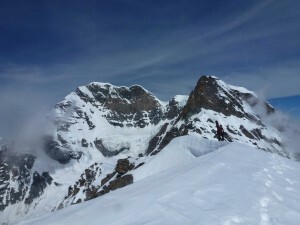 Depuis quelques années je suis de plus en plus attiré par les lignes visibles depuis chez moi... Une goulotte en face Nord de Blaitiere m'intriguait depuis un certain temps, nommée péjorativement facette Nord Est dans les topos et ouverte en juin 1965 par C.Mollier et F.Audibert. 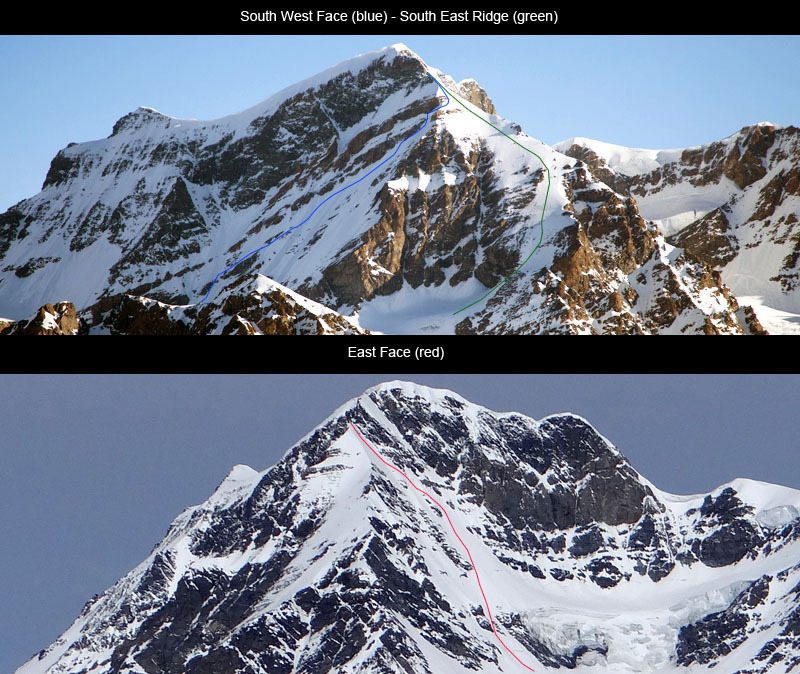 La description du topo ainsi que la cotation (obsolète) ne sont pas attrayantes non plus mais la ligne semble évidente et logique! 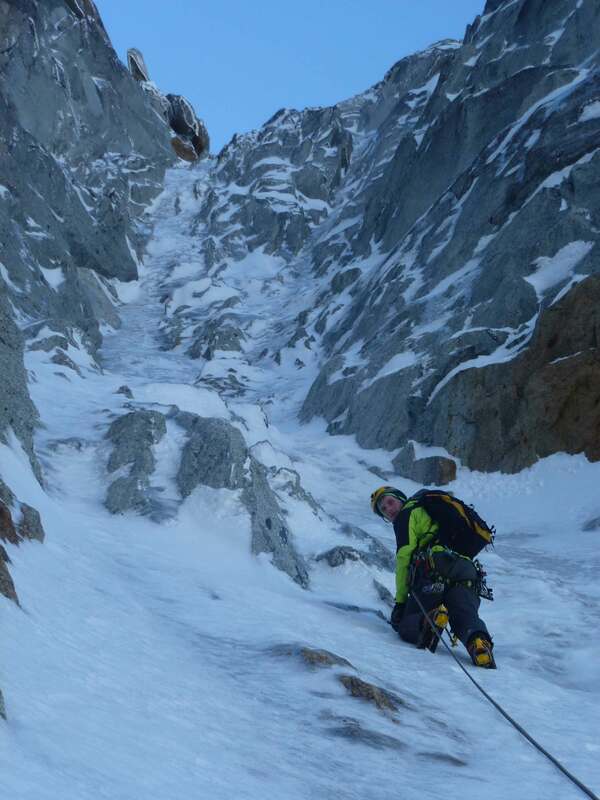 Cédric est intéressé par le Lagarde Segogne au Caïman, une voie mythique et mystérieuse, un pas en avant dans l'escalade glaciaire dans les années 20... Qualifiée d'erreur d'itinéraire à ne pas reprendre dans un topo Vallot des années 50, cette voie est désormais reconnue pour son esthétisme mais reste cependant peu parcourue à cause d'un accès délicat et exposé... L'enchaînement des deux goulottes devient une évidence, d'une logique implacable vue depuis ma maison, un couloir assez évident à redescendre sert de liaison entre les deux goulottes. 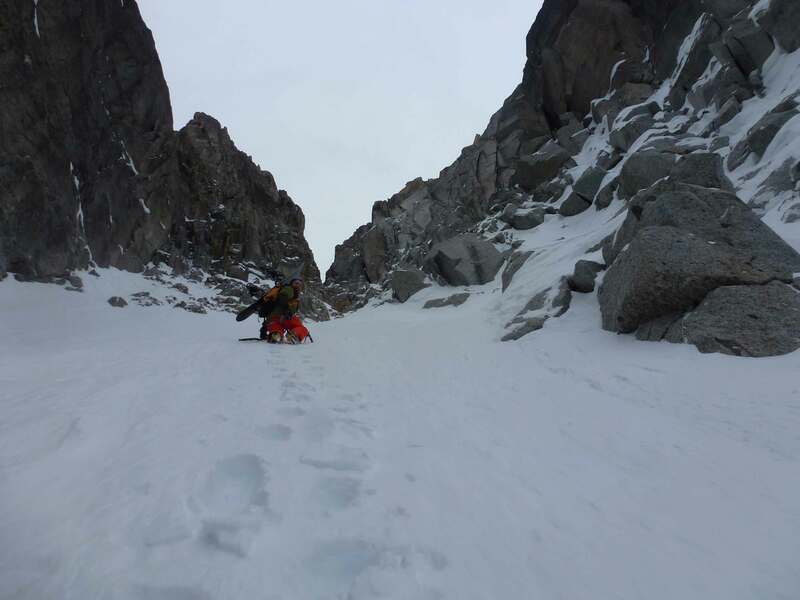 Le créneau météo arrive et Louis est de nouveau de la partie... Après une confortable nuit au refuge du Plan, trois heures de marche nous mènent au pied de la goulotte de Blaitiere au lever du jour... L'escalade est magnifique, intéressante mais jamais très raide. 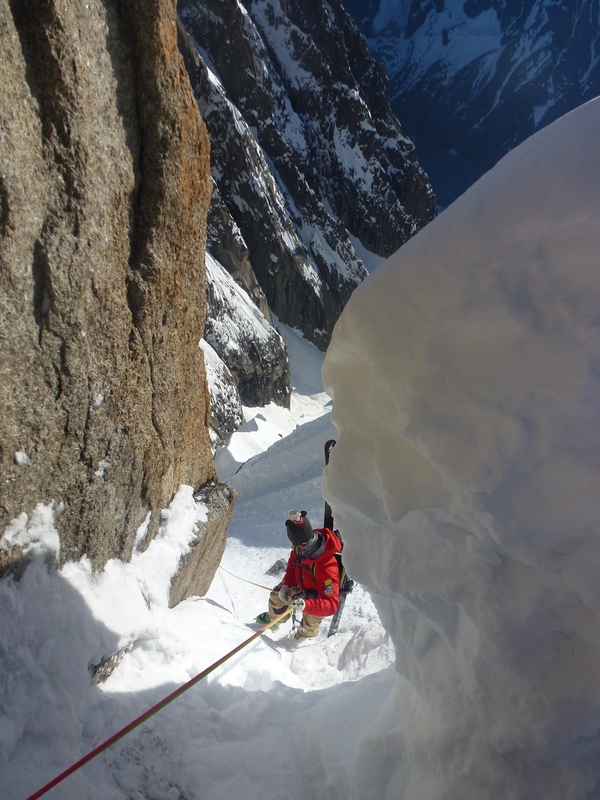 Les  400 mètres de goulottes sont avalés en quatre grandes longueurs et un peu moins de trois heures. 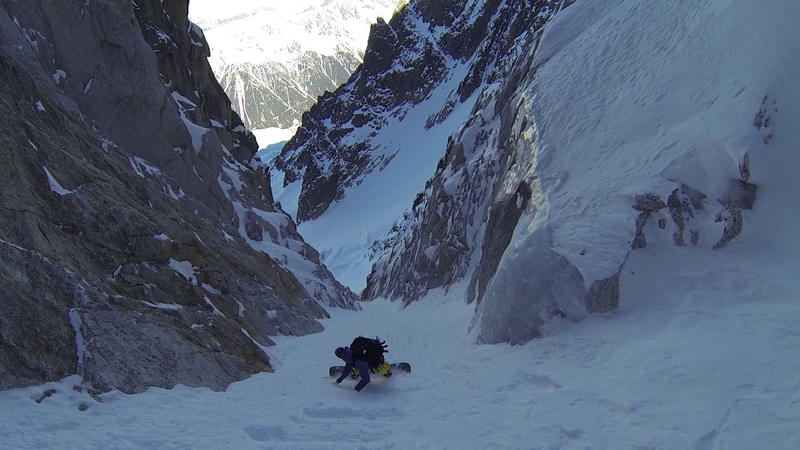 Au col nous avons une vue imprenable sur le fameux Lagarde Segogne et la descente s'enchaîne bien, moyennant quelques rappels dans le milieu du couloir... Quelques mètres au dessus du glacier suspendu, nous reprenons l'escalade par une grande diagonale logique bien fournie qui permet d'accéder à la goulotte proprement dite. 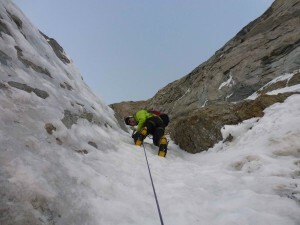 La pente se raidit et la glace se durcit un peu, six longueurs avec quelques ressauts raides mènent au pied du Caïman. La longue traversée à l'aiguille du Plan est en bonnes conditions et permet une progression assez rapide dans une ambiance magnifique avec enfin du soleil... Une trace salvatrice nous permet d'être efficaces sur Midi Plan et nous rallumons les frontales au col du Plan pour le dernier effort à fournir! Arrivée à vingt heures au sommet, après dix sept heures d'effort pour cette longue ballade... Définitivement une des plus belles courses que j' ai eu la chance de réaliser dans ma vie d'alpiniste, à refaire avec plaisir! Septembre 2014 restera dans les annales de la face Nord des Grandes Jorasses pour deux raisons, les conditions exceptionnelles dues à cet été humide mais aussi malheureusement la sur fréquentation. 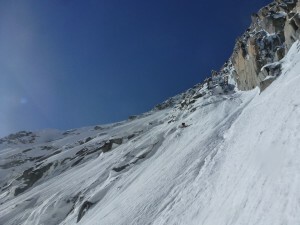 Des hordes de grimpeurs font la chenille dans les classiques, le refuge est plein à exploser et le sérac fait des siennes côté italien. 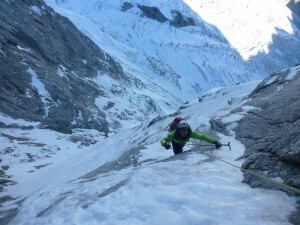 Malgré son austérité cette face attire les clients par son côté historique, et c'est un peu malgré nous que Louis et moi allons nous affuter les mollets sur la glace des Jorasses dans les semaines à venir! Après avoir partagé pas mal de courses cet été avec un client chacun, il est temps de passer en mode grande course à 2 guides et d'améliorer notre technique en corde tendue... Les deux premières ascensions se font par la voie Rêve éphémère d' alpiniste à cinq jours d'intervalle, les conditions sont incroyables mais l'escalade difficilement protégeable... 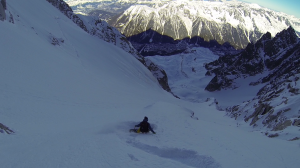 Le retour se fait côté français par le glacier de Leschaux. 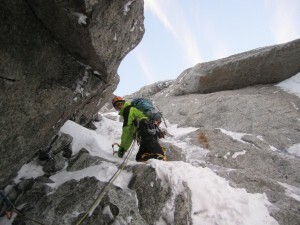 Mi septembre, la gardienne du refuge jette l' éponge mais la fréquentation, de plus en plus internationale, reste intacte. 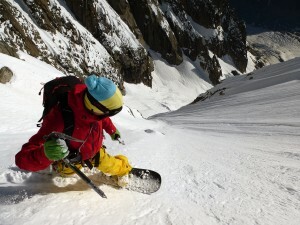 Cédric veut retourner se faire masser les mollets et c'est la voie polonaise avec variante Michto qui s'en chargera. Sortis au sommet en fin de matinée, nous sommes les premiers a redescendre et devrons faire la trace sur le glacier avant d'arriver six heures plus tard à Planpincieux et son bar salvateur... Un dernier passage sans encombre par la Belle Hélène avec Karl et la boucle est bouclée, quatre faces Nord des Jorasses en moins d'un mois, la saison est belle et bien rattrapée! 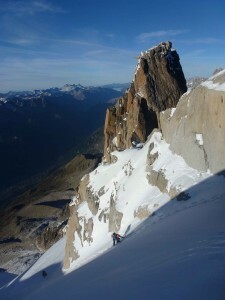 Au milieu de ce pèlerinage une sympathique ascension avec variante de la voie Mauer 1879 en face Nord de l'aiguille du Midi et une ascension du Frendo version hivernale, un mois bien chargé pour finir! 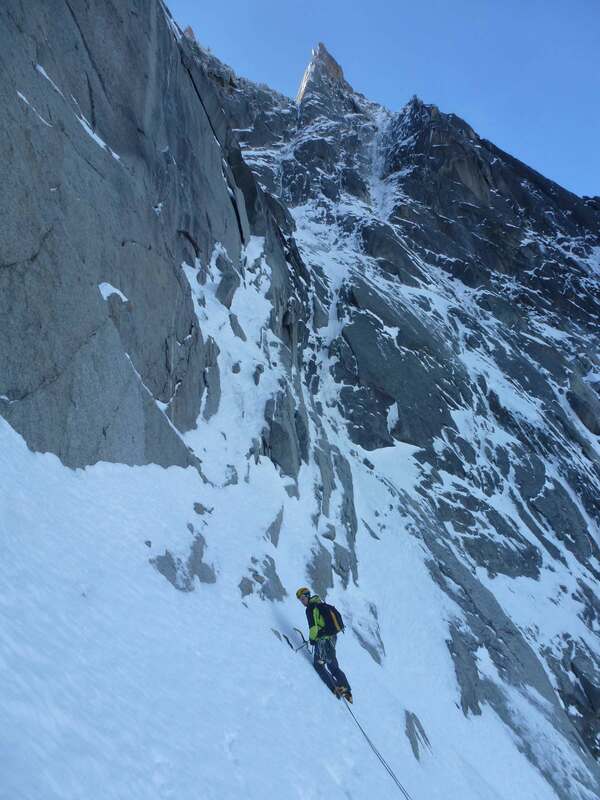 Last September conditions were exceptional in the North face of Grandes Jorasses, but unfortunately it got really crowded with parties coming from all over the world. 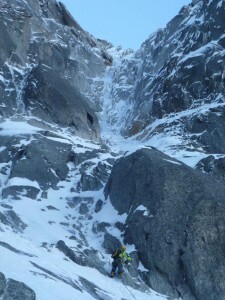 Some days more than 80 people were climbing on the wall. 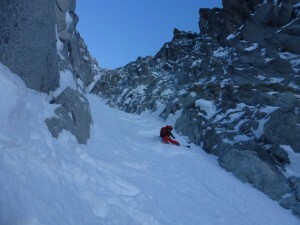 Still it was possible to find quiet routes and we guided with Louis 3 different ones in this month. Two times climbing Reve ephemere d alpiniste first, with a way down on Leschaux glacier. 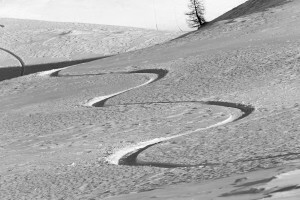 Then once the Polish route with Michto variation and once the Belle Helene route, with a walk down the italian normal route. 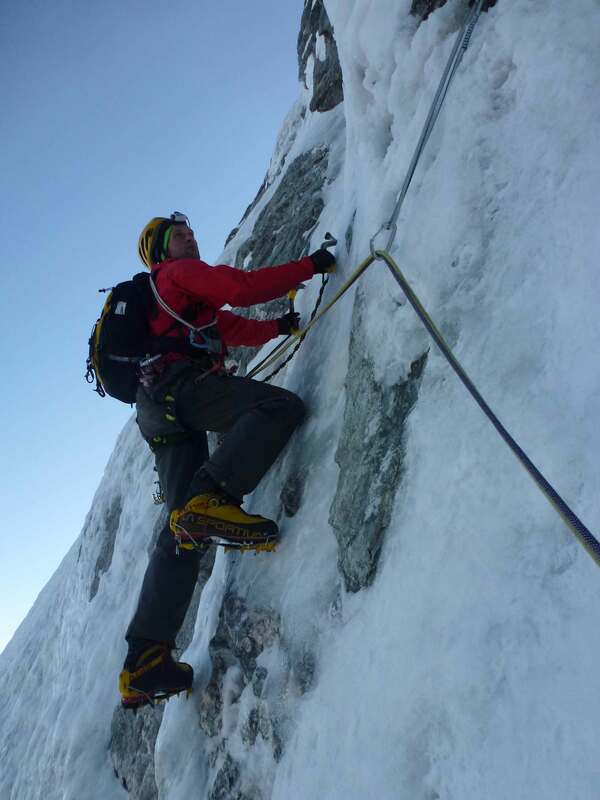 Legs are stronger than ever now.